SRKWs have twice turned away from California in recent years, probably because they failed to find enough fish to warrant continuing their southward journey. In March 2015, L and K pods were sighted briefly north of Cape Mendocino but the track of L84 who carried a satellite tag did not continue further south that spring. 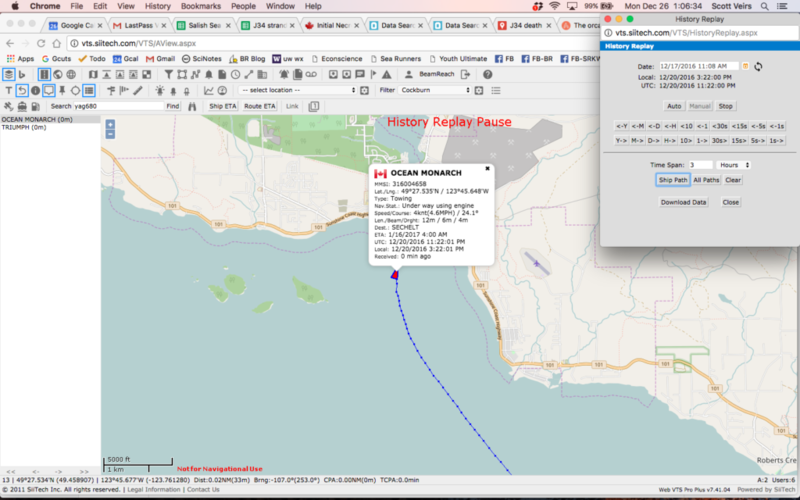 There was a similar excursion into northern California on Jan 19, 2016 by K pod (inferred from the track of the satellite tag carried by K33), but again the orcas turned around. 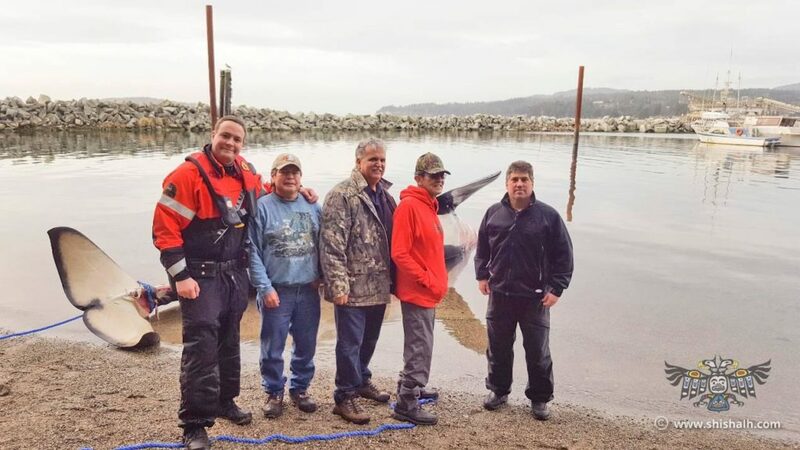 This visit should be heralded by Californians as a clear indication that Chinook recovery may have worked a little bit in your State and should continue! This year the orcas decided it was worth going all the way to Monterey. But the visit should also provide this more urgent message: California salmon are critical to the recovery of the SRKW population and the needs of orcas should be prioritized in ongoing efforts to recover salmon and manage water in the State. This winter and spring, the SRKWs continue to seek their preferred prey, Chinook salmon, all along the west coast of the continental U.S., just as they most likely have done for millennia (especially during the last glaciation when the Salish Sea was solid ice!). 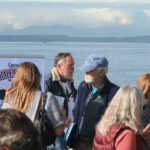 We should understand this behavior as a clarion call for us all to work together to bring Pacific salmon back to west coast rivers. For L pod in particular, and likely K pod, too, it’s important to recover salmon not only in Washington and British Columbia, but also in Oregon and California. A good omen is that the latter States have abbreviations that combine to spell ORCA! It’s a safe assumption that the wise matriarchs of L pod are expecting the amazing abundance of salmon that long-ago returned to the Sacramento and San Juaquin Rivers. 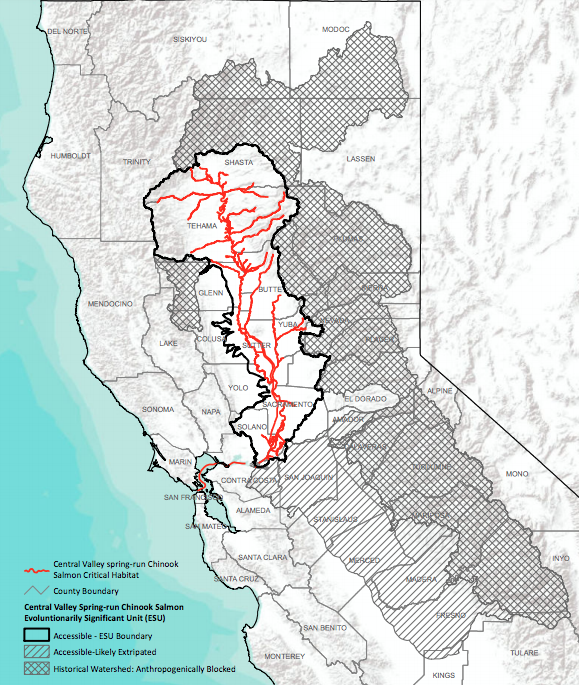 These rivers formed the vast, fertile central valley of California and are fed by countless tributaries that drain the west side of Sierra Nevada mountain range. L pod’s southward search each winter-spring is probably led by the deep memories of L25 (aka “Ocean Sun”) who is estimated to be in her 90s. She could be remembering the California salmon run sizes of the 1930s! 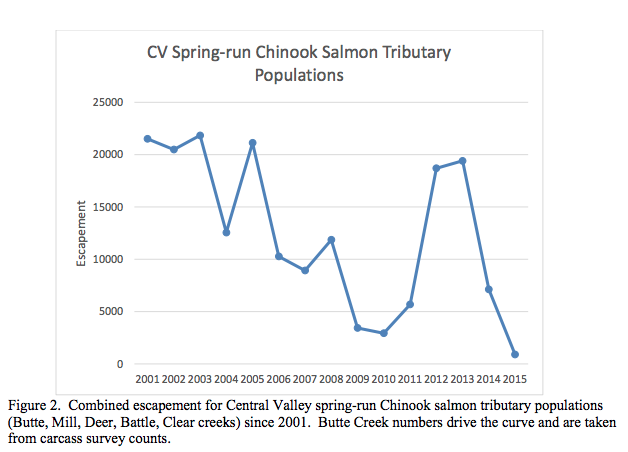 Best estimates put the historic size of the Sacramento-San-Juaquin spring-run Chinook run at more than 600,000 fish in the late 1880s to 1940s (CDFW Status review, 1998). 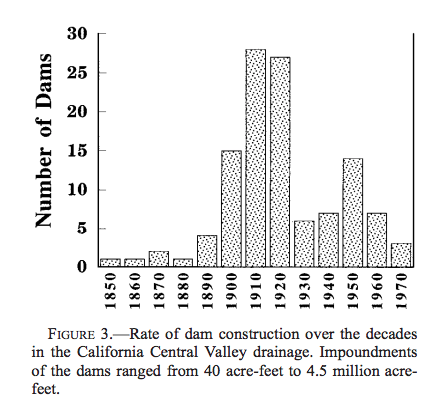 The relevant recovery plan states that after ~1940 dams had extirpated (driven to local extinction) the spring-run Chinook in the San Juaquin River and that the total spring run varied from 3,000 to 30,000 fish between 1970 and 2012. L25 likely witnessed Chinook runs on the continental shelf from Monterey Bay north that were almost 100x the size of modern returns (i.e. recent minima of a few thousand fish, or less) in an era when the dams that would devastate the runs were just beginning to be built! The recent state of Sacramento Chinook is a total run down to less than 1,000 fish. See also Figure 1 of the 2016 Status Review for a break-down by tributary which shows how the main-stem Sacramento population flat-lined in 1990.
years based on the population size or rate of decline criteria. Just like in Washington and BC, the main fresh-water problem for salmon is human development. What was previously pristine habitat is upper watersheds is now a vast inaccessible area (cross-hatched on the map). As of now, Sacramento Chinook have lost some 70% of their original spawning habitat. 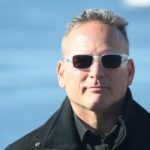 On top of that, water has always been in very high demand in California; it’s such a scarce resource that large parts of the San Juaquin River have been pumped dry for decades and cities like San Francisco are being forced to fight in court for their historic water rights or invest in conservation technologies. 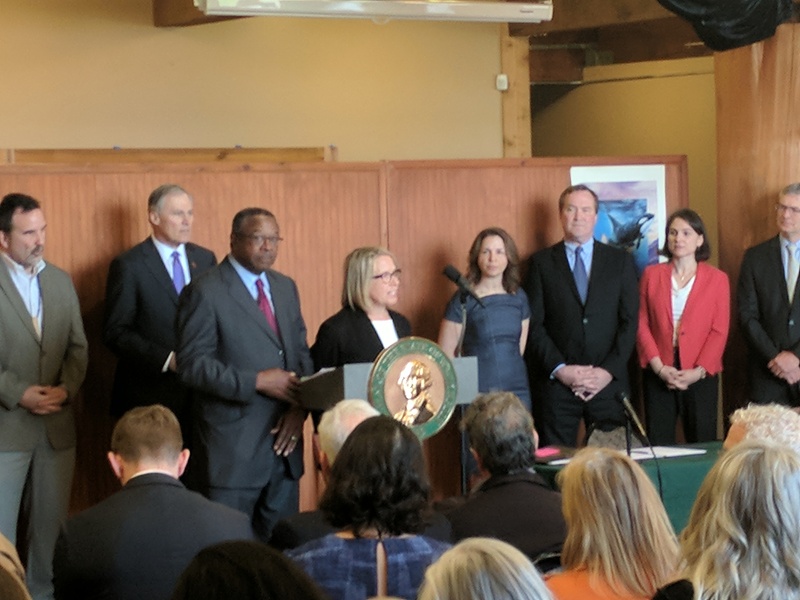 Recovering Pacific salmon, particularly Chinook, in California will be big challenge for us humans, just as it’s a grand challenge in Washington State. Perhaps together we can find the will and means to save both the orcas which connect us through their migrations, and the salmon that they seek year-round. Take action this spring, wherever you live along the west coast. Go watch Artifishal (screenings start this month!). Support a salmon conservation organization in every State or Province, not just your own. 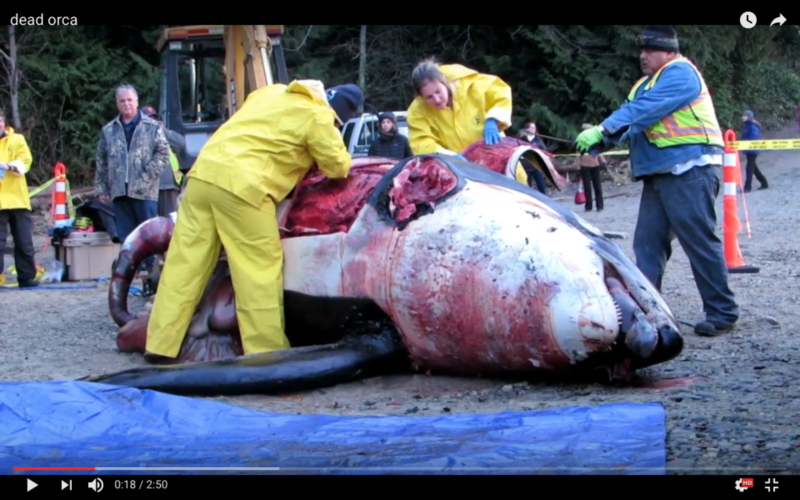 Make a personal sacrifice for the whales and the fish! I learned writing this that the eldest orca sighted on Sunday in California, ~90-year-old L25 is also the mother of Tokitae, the last-surviving southern resident orca in captivity. Wouldn’t it be wonderful if the Miami Seaquarium returned her to a sea pen in her native Pacific summetime habitat? 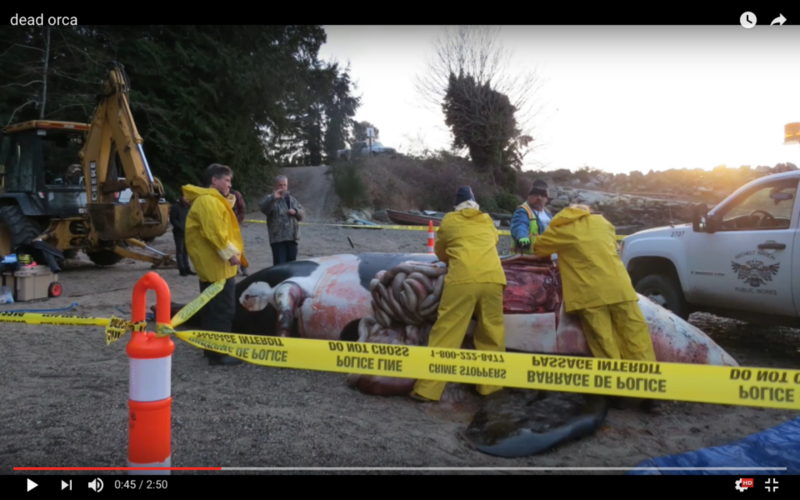 Two years ago today, on Tuesday 20 Dec 2016, the dead body of a southern resident killer whale (SRKW) known as J34 was discovered floating in the Strait of Georgia just north of Vancouver (BC, Canada). Also known as Double Stuf, J34 was a beloved adult (18 y.o.) 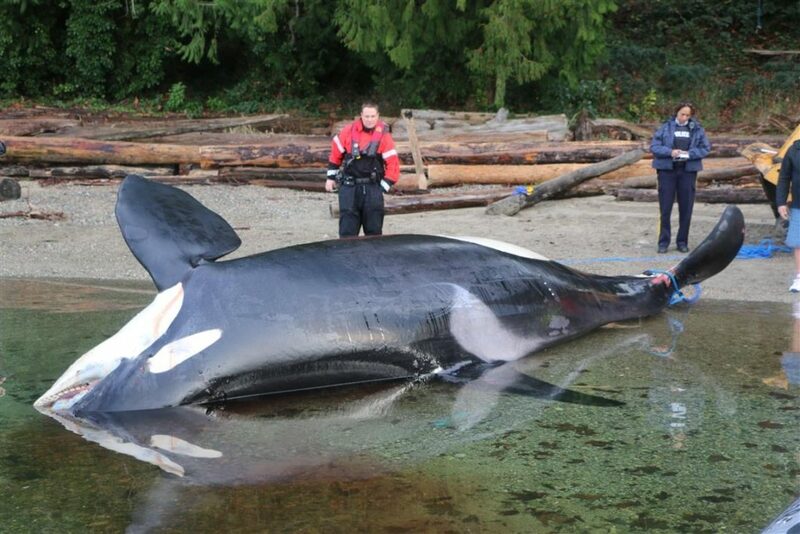 male member of J pod who suffered “blunt force trauma” from a still unknown or unspecified source. 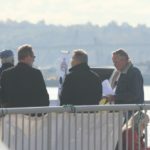 We should ask every year, on December 20: what killed J34 and how we can prevent such tragic losses from happening again? 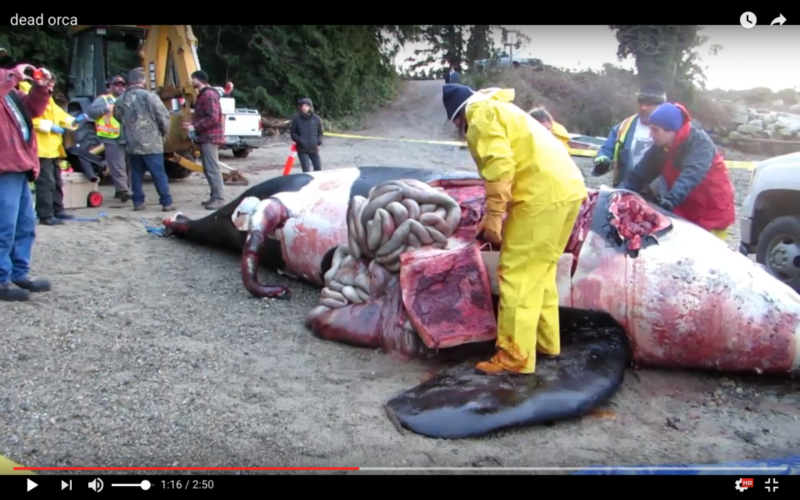 This post serves as a place to aggregate what we know about the stranding of J34. 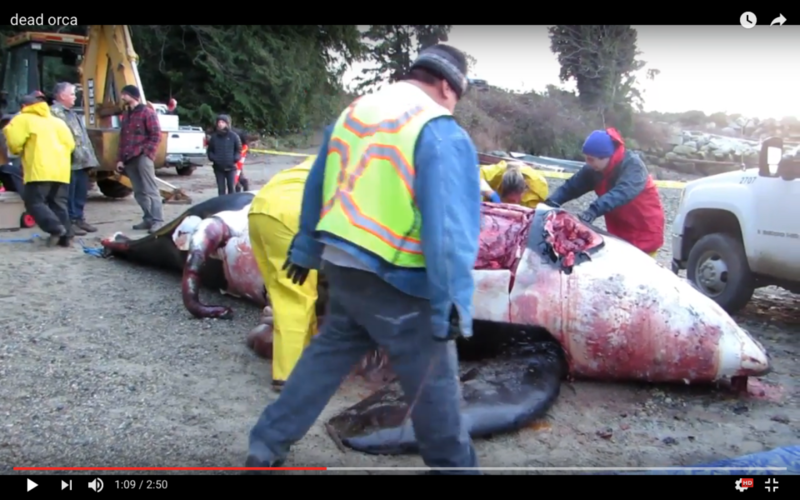 It is revised whenever new information surfaces from the investigation of his death, and as we learn generally about the nature and causes of blunt force trauma in cetaceans. The post is organized into three sections: evidence; discussion; and conclusions. Please add your contributions in the comments. We’ll intermittently incorporate new information and ideas into this post. 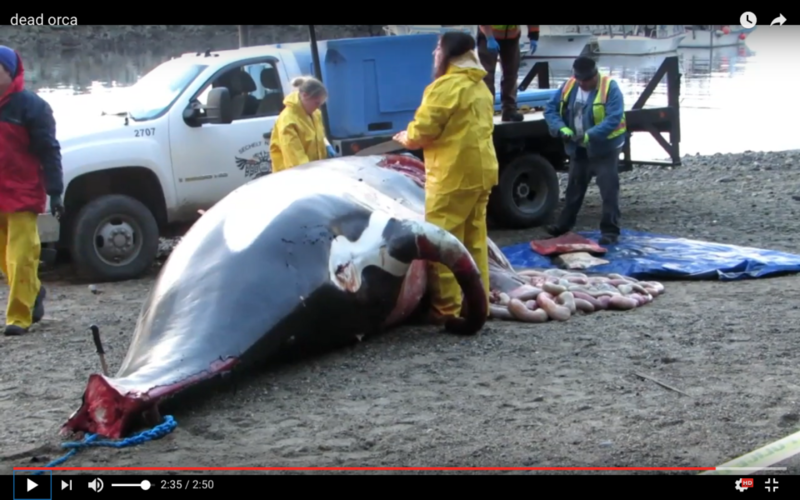 Citizen scientists are welcome to process, re-analyze, or contribute to the J34 stranding raw data archive. 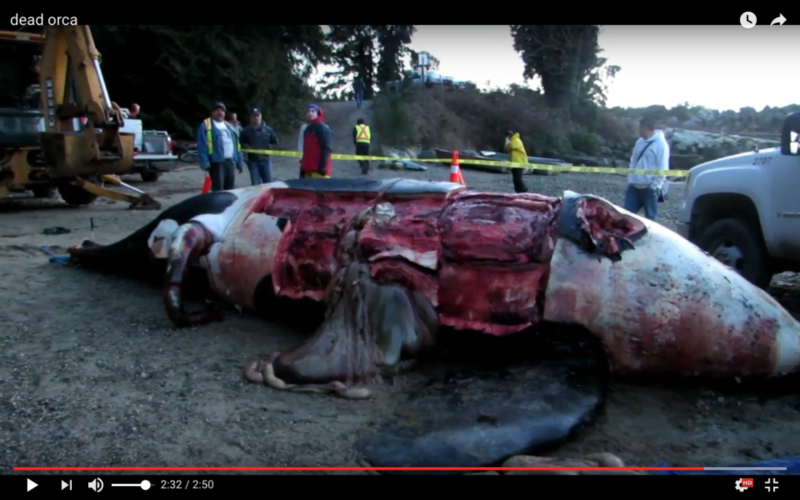 We also maintain a similar on-going blog post regarding the stranding of SRKW L112 in February, 2012, which may provide valuable comparisons to the case of J34. 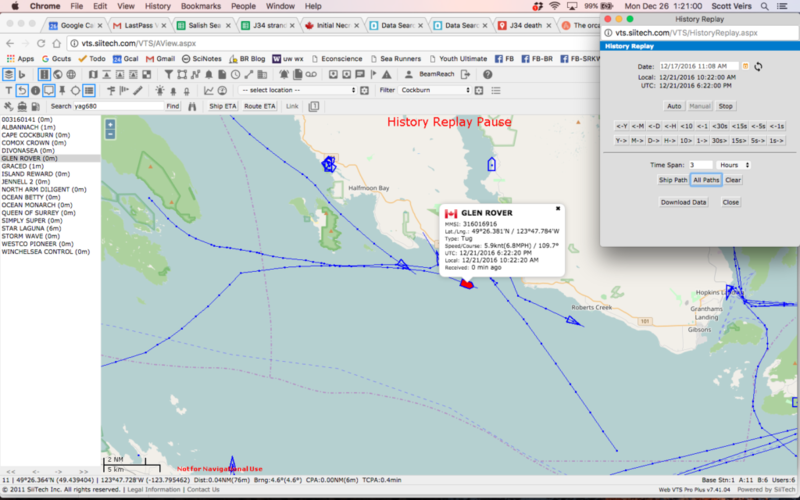 Here at Beam Reach we are especially motivated to learn as much as we can from J34’s death because as a younger whale (in 2007), he and his immediate family gave us bioacousticians a very rare opportunity to spatially document communication of SRKWs by using an array of hydrophones to localize each call. 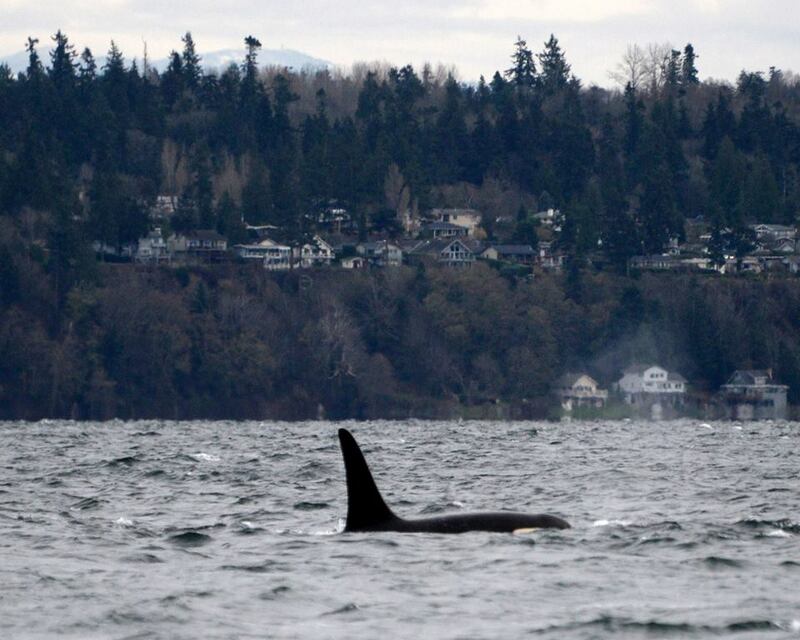 While J34 and his mother, J22, traveled along the west side of San Juan Island, his four-year-old brother J38 (a particularly curious juvenile?) strayed away and made a rare, close approach to an array of hydrophones we were towing behind our hybrid-electric research catamaran. In the animation, you can listen to these family members calling back and forth as you watch the moving dots which indicate the relative locations of J38 and J34/J22. We don’t know if the responses to J38 came from his mother or his sibling (because the stay closer together than the precision of our localizations), but on dark days like December 20 it’s heart-warming to think of J34 as an attentive and talkative older brother. 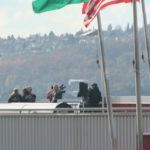 This remainder of the blog post contains photographs and videos of dead orcas and the necropsy of killer whales, including J34. A necropsy, also known as an autopsy, is a postmortem examination that often includes anatomical dissection. Please don’t read on if you would rather not view these media which can be upsetting, but contain essential information for understanding what mechanisms injure and/or kill wildlife that we all value and want to conserve. The following sections present the various lines of evidence that are pertinent to understanding the stranding and injuries of J34. To understand each line, it may be helpful to refer to the J34 stranding map and/or the J34 stranding chronology. 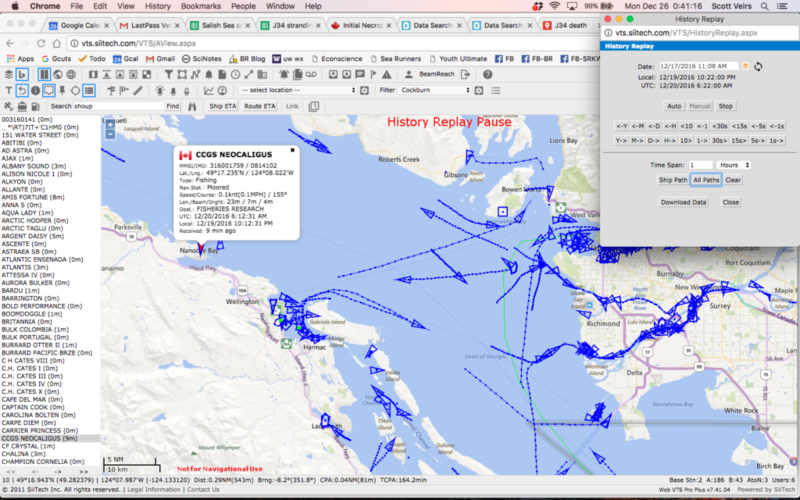 The J34 stranding map shows the last sighting of J34 (in Puget Sound) on 12/14/16. 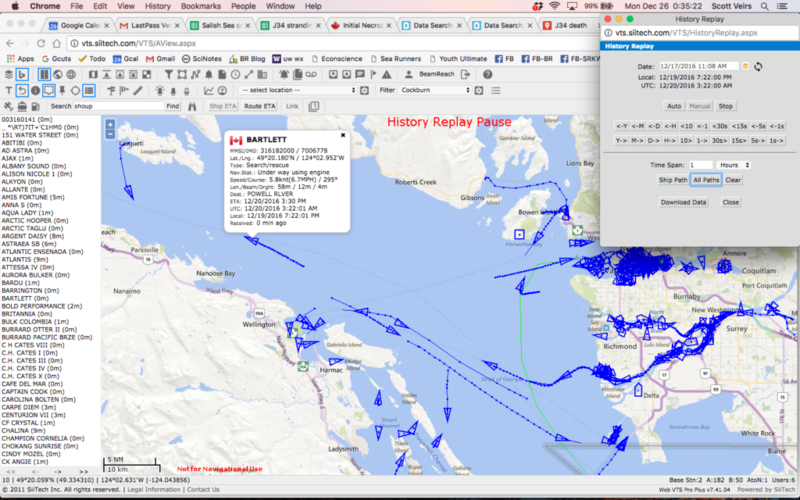 It also depicts the progression of acoustic detections of J pod from Haro Strait (at 3 am on 12/17) to the Fraser river delta (~9 hours later, just after noon on 12/17). 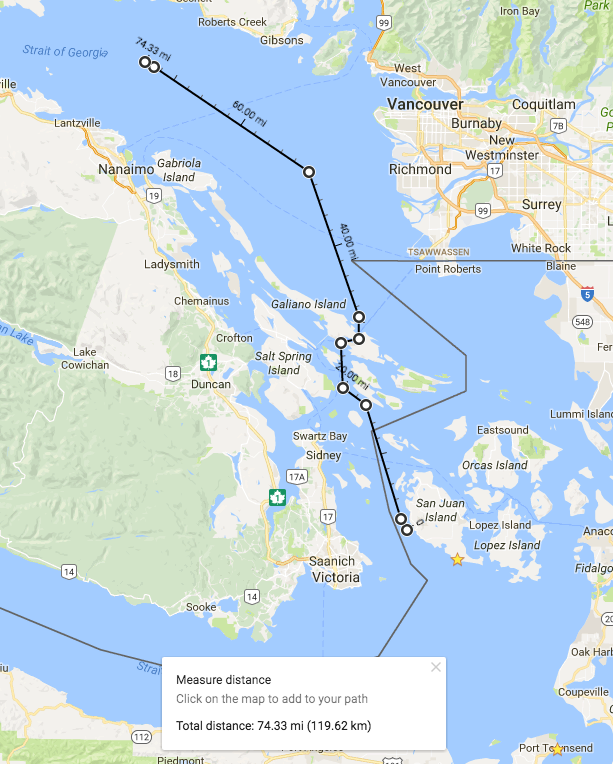 The map below suggests that if J pod took their typical route via Active Pass, the distance traveled in those 9 hours is about 50 km, suggesting their speed was 5 kph (a typical mean speed for SRKWs). 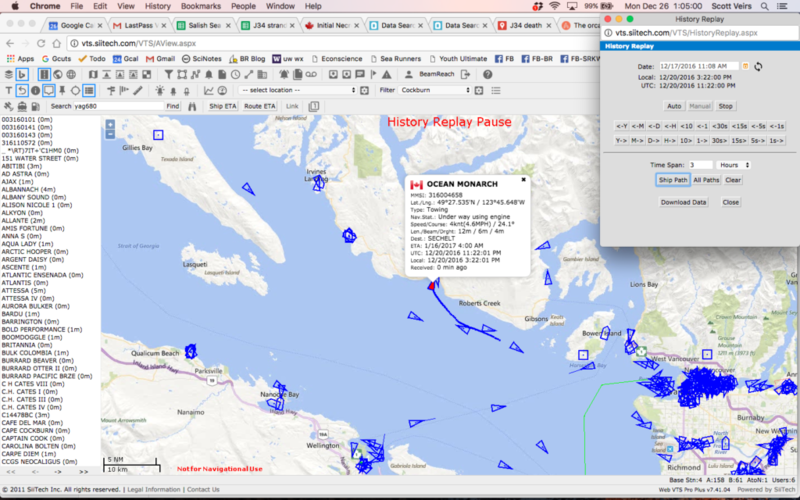 If they had continued into the Strait of Georgia at that pace, they could have reached the vicinity of the stranding (another 70 km along the estimated track below) in about 14 hours, hypothetically arriving around 4 a.m. on Sunday 12/18/16. 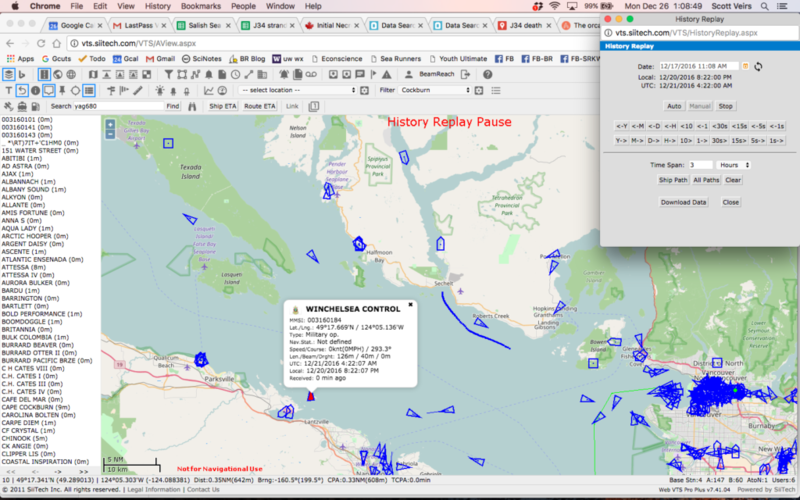 The U.S. sighting networks observed and identified many of the J pod whales that J34 was with when in Puget Sound and in San Juan County on the Dec 10th and the 14th. On 12/14/2016 ~14:00:00, Orca Network reported J pod at Point Robinson (see photo below). The pod went as far south as Point Dalco and turned back east and then north at 16:35. 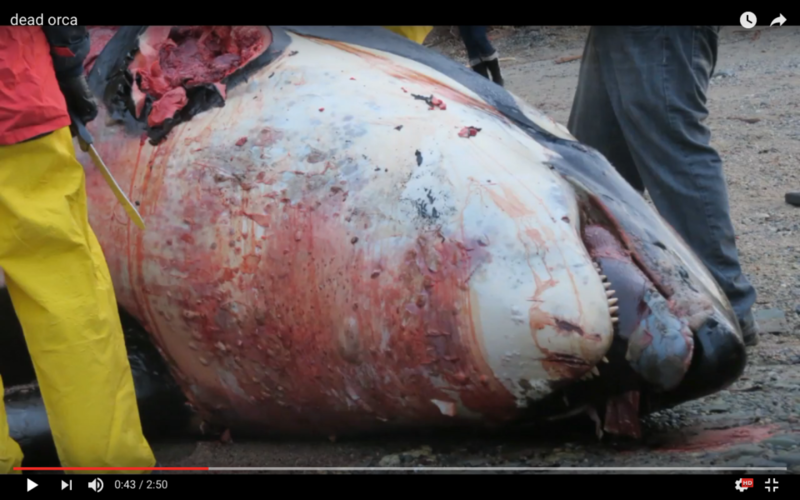 Distributions simultaneous to the stranding? 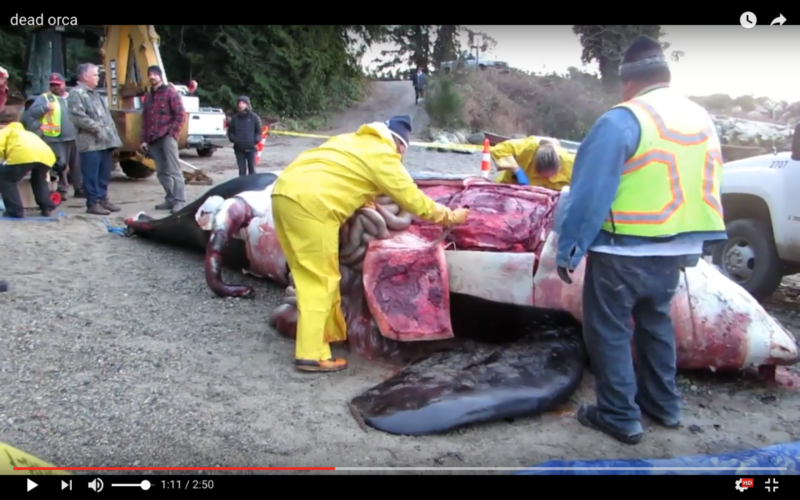 Are there any sightings or hearings of SRKWs and/or other marine mammals during the possible period of the stranding (roughly first 12/18-20/2016)? 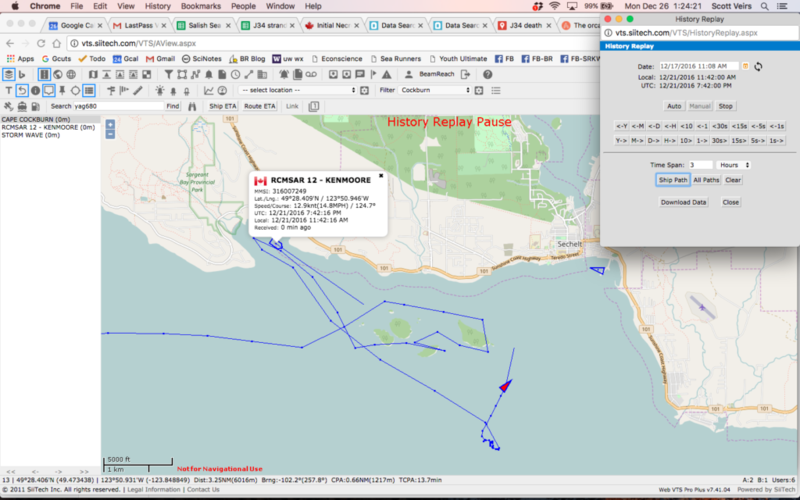 At almost exactly the same time that J34 was located off Sechelt, J pod went south through Haro Strait (on 21 Dec ~10:00) along the west side of San Juan Island. Three days later (12/24 ~16:10) J and K calls were heard on the Lime Kiln hydrophones (lasted 2 hours). Also on 12/24/2016, Jeanne Hyde reported hearing T018/T019 matrilines on the Orcasound Lab hydrophone (5 km north of Lime Kiln). Were any other Bigg’s KWs sighted to the north or south, before, during, or after the stranding? 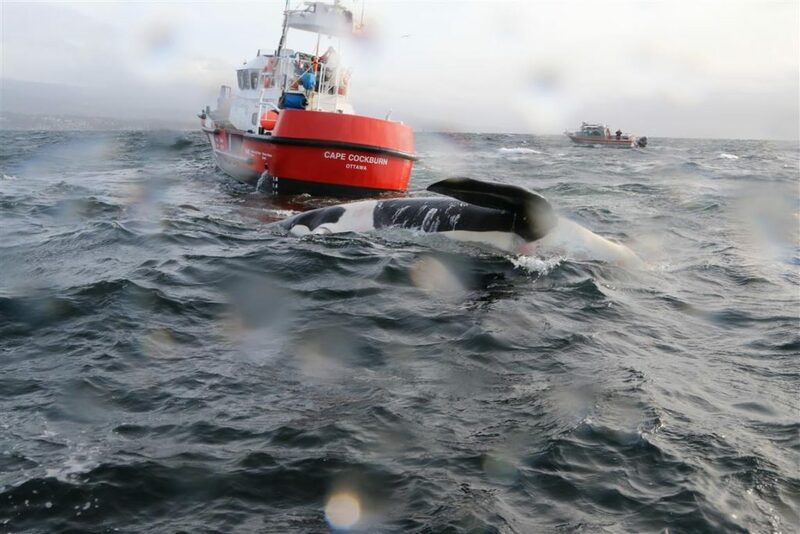 A southerly wind off Sechelet was significant (~15 kph) and rising as the body of J34 was secured and towed to shore in the late morning of 21 Dec 2016. Prior to that southerly wind event, however, the previous 24 hours experienced light northerly winds (<~5 kph). Earlier in the week — between Dec 18 and mid-morning on Dec 20 — similar light northerly winds were interrupted by 2-3 other strong southerly events. The most significant southerly storm had peak wind speeds of almost 30 kph and was sustained near 20 kph for ~18 hours, blowing consistently out of the southeast (from ~120 degrees true; towards ~300 degrees true) . Wind speed observations from the Sechelt station (86 m elevation). 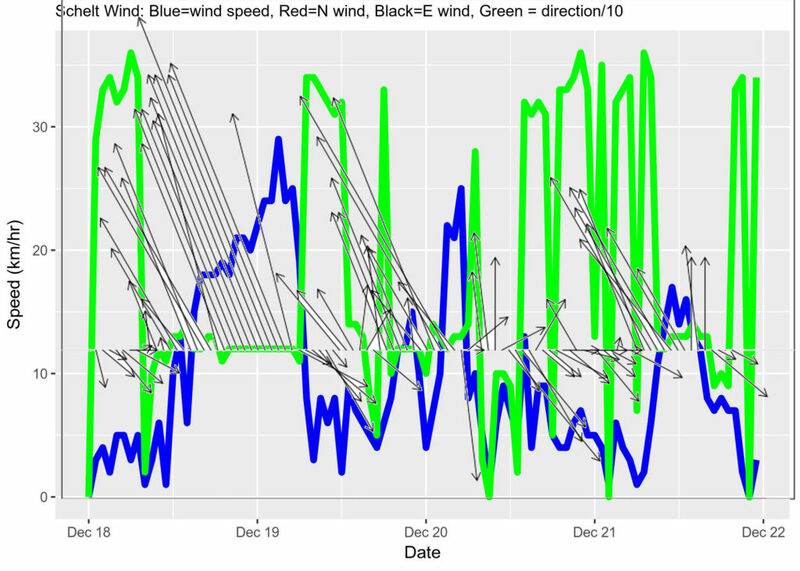 Blue wind speed (in km/hr) and green wind direction (in degrees true divided by 10) are also depicted as black wind vectors. You can see the southerly that was building as J34 was towed to shore just before noon on Dec 21, as well as the previous southerly events interspersed with northerly or confused light winds. 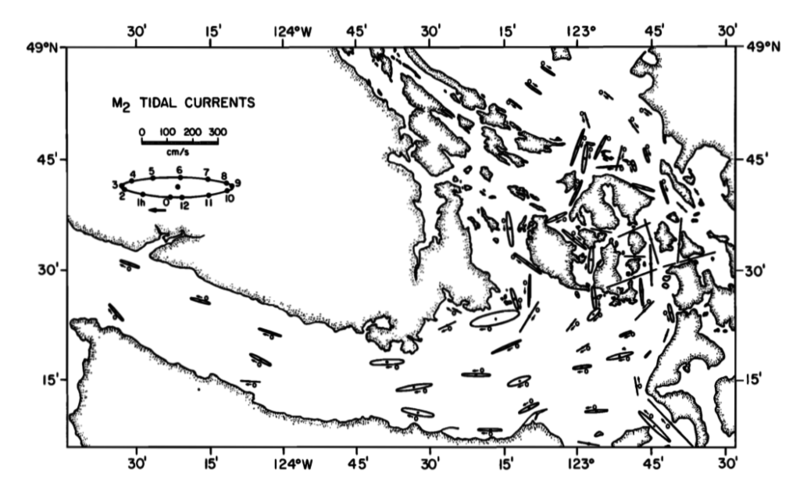 While currents are strong off of Victoria in the Strait of Juan de Fuca, they mostly slosh back and forth in the Strait of Georgia north of the Gulf Islands in NW-SE alignment with the general bathymetry. While a trajectory model should integrate net transport from surface currents, our current assumption (pun intended) is that the net transport was negligible and therefore the drift trajectory of J34 was governed mostly by the wind. Tidal height is probably not relevant as the dominant wind direction suggests the carcass likely did not encounter the shoreline prior to being discovered. For the record, though, here is a time series from a local tidal station. 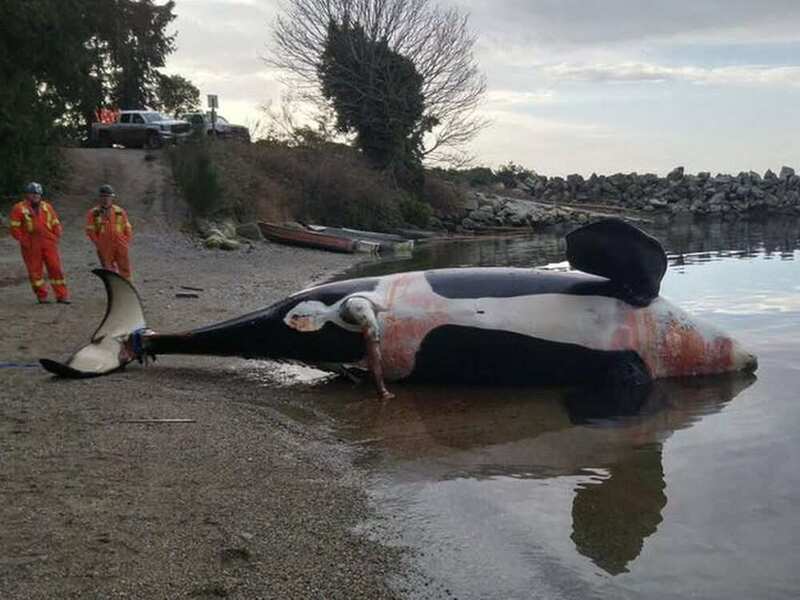 An approximately 18 year old male killer whale, identified as J34 was found dead near Sechelt, B.C. on December 20th, 2016. 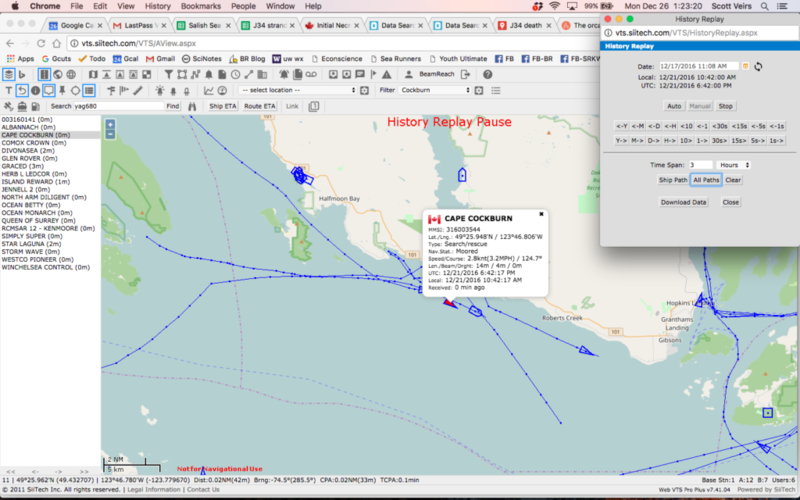 These text-based descriptions of the discovery led us in late December 2016 to query a Automated Identification System database (Siitech) for vessel location information. We searched the results for tugs and Canadian governmental vessels in the vicinity of Sechelt. We also noticed a strange pattern of AIS vessels (stationary?) showing up and disappearing within the Whiskey Golf area near Nanoose Bay (present ~12/17; absent until ~12/19 20:30; present intermittently between 12/20 9:00; details in the chronology spreadsheet). The key findings were multiple tugs in the vicinity around 10 a.m. on 12/21 that could have reported the sighting first that morning. About the same time the Canadian Coast Guard vessel Cape Cockburn appeared to search inshore of the Trail Islands and then intercept one of the path of one of the tugs. Afterwards the Cape Cockburn track is nearly stationary (indicating the period when they were securing the carcass for a tow), and then it proceeds directly to the mainland indicating the approximate position of the beach where the necropsy was performed. Pending more detailed analysis with the best available current observations, we take the prevalence of southerly wind events in the days prior to the stranding as sufficient justification to add a rough direction of drift to the J34 stranding map. 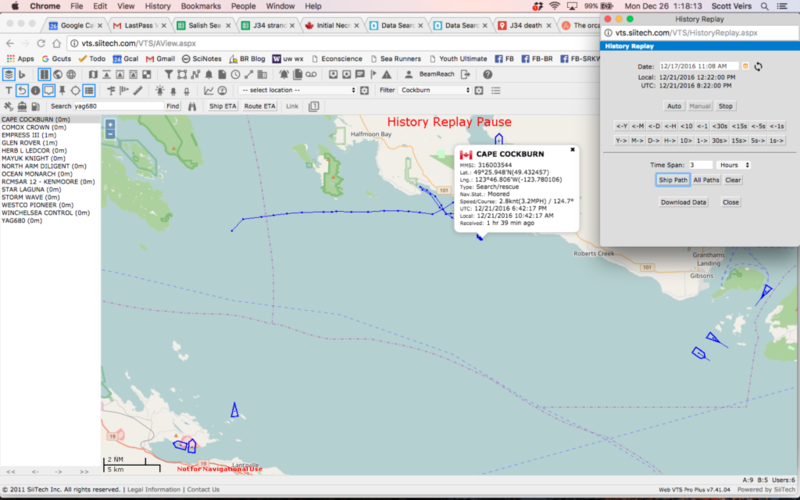 The yellow line (screen shot below) represents the trajectory and is extending from the first high-confidence carcass location (the Cape Cockburn AIS lat/lon on 21 Dec 2016 at 10:42). Rough estimate of the trajectory of J34 (yellow line), assuming that drift was governed predominantly by wind. 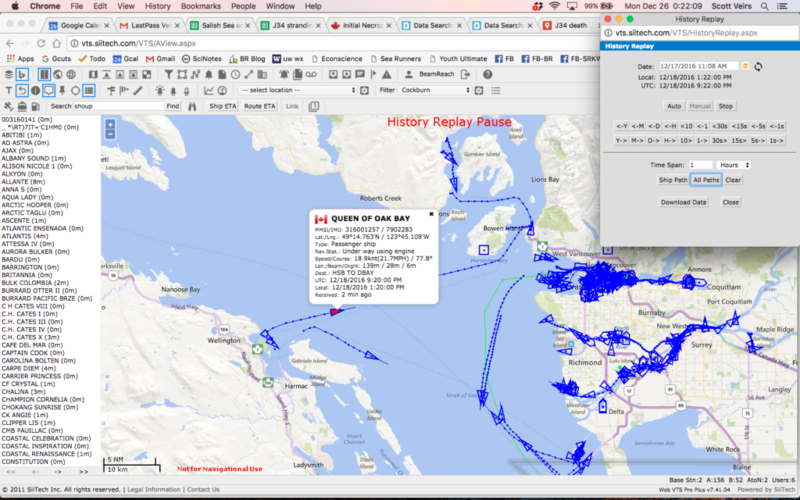 The red fish connected to the yellow line represents first known location of J34 (where the carcass was secured; based on AIS positions for Canadian Coast Guard vessel Cape Cockburn. The ruler shows a 10 km (6 mi) distance for scale, though we have not yet attempted to estimate a drift speed for the carcass. 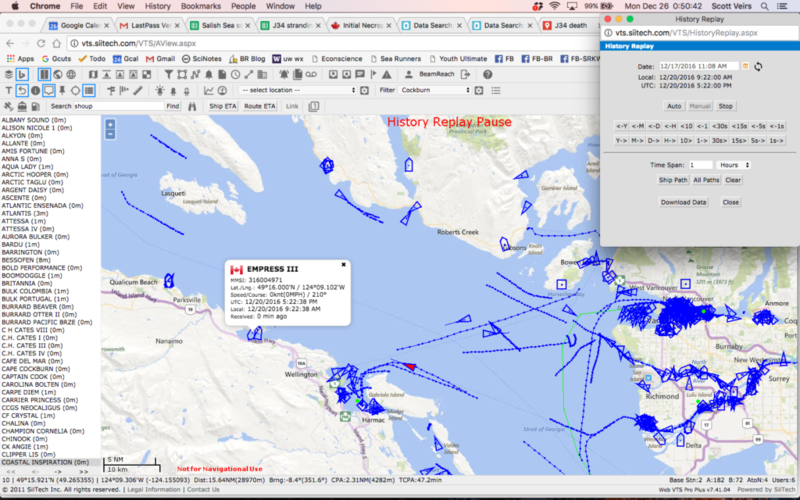 An important future step will be to review the literature regarding drift modeling for other killer whales or cetaceans. What is best methodology for modeling post-mortem transport? Was it used and was it consistent between the J34 and L112 strandings? 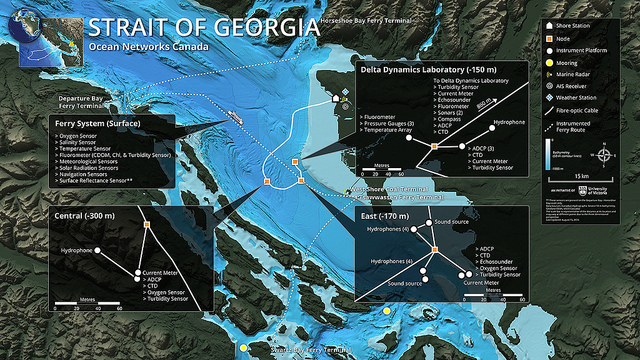 What role could advances in 3D hydrodynamic current models of the Salish Sea (PNNL | WA Dept. of Ecology) play in stranding investigations — past and future? 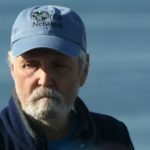 It will be very valuable to learn what indications, if any, in the final necropsy report can constrain how long J34 may have drifted, and how long and fast he may have swum after being injured. 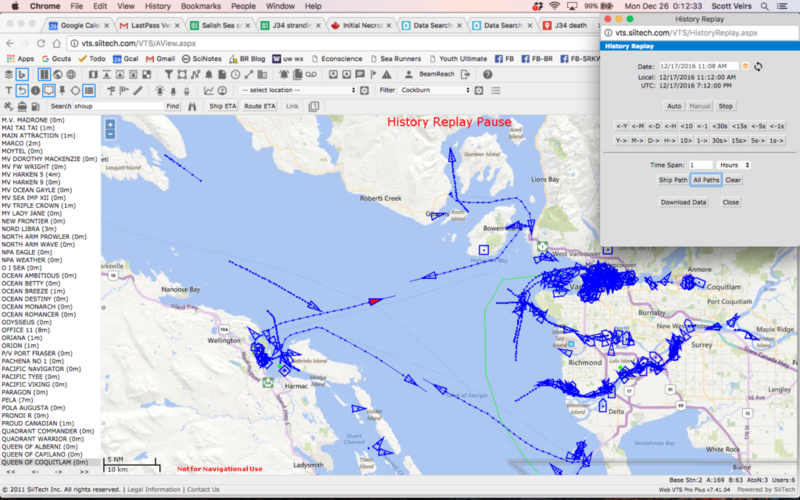 With this added information we may be able to determine if the trajectory overlaps with the Whiskey Golf naval testing/training area, the Horseshoe Bay – Nanaimo ferry route, other regions of high vessel-density around Vancouver, and/or distributions of other marine mammals. 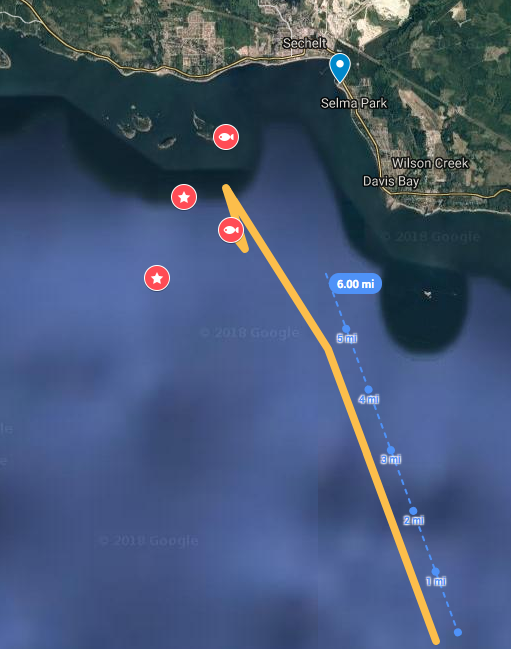 Due to proximity of the stranding location and preliminary trajectory to the Whiskey Golf area, and to acoustically establish presence/absence of marine mammals, we completed an initial evaluation of a subset of the hydrophone data that might help inform the stranding of J34. Most importantly we detected the calls of SRKWs on 12/17/2016 at ~12:11:02 off Fraser River mouth, BC. 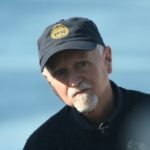 The calls were faint, but very likely from J pod based on confirmation of call (S1, S2, S3s, possibly an S7, and a S17 later) by Monika Wieland. On 12/17/2016 at 11:31:02 we noted strange tonal sounds that may have been a distant power boat, but could also have possibly been related to mid-frequency active sonar. And on 12/18/2016 at 22:01:02 we heard a low-frequency rumble — which might possibly be interpreted as a reverberating detonation. These potential military noise signals, however, were very faint and we have little confidence in their interpretation at this point. 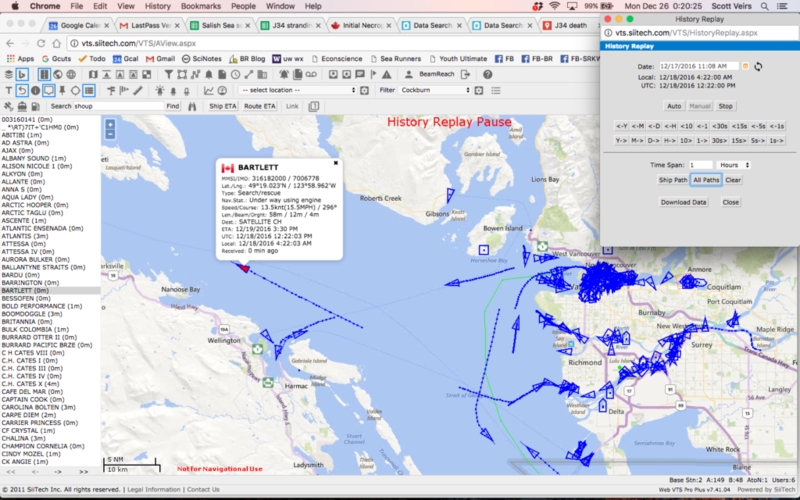 Finally, we heard humpback calls on 12/19/2016 at ~9:41:02, indicating the presence of other marine mammals in the vicinity of the Fraser river delta two days before J34 was secured. Any military testing/training activities planned? Were there any other intense sonic events reported in the week prior to the stranding, like earthquakes or lightning strikes? An impressive team of experts conducted a necropsy on the beach more-or-less immediately. The necropsy was performed by Dr. Stephen Raverty. 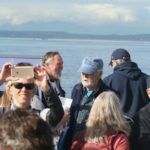 Also present were DFO Pacific Region Marine Mammal Coordinator Paul Cottrell, other DFO staff and biologists, as well as staff from the Vancouver Aquarium. 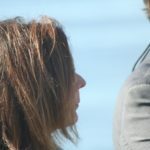 Because the final necropsy report has not been published, despite repeated requests by Beam Reach for updates from DFO, this section currently presents only the initial results, a summary of the final report, observations from other experts, and diverse photographic and video documentation from all sources that we’ve been able to find. Luckily there were some excellent videos taken by some of those present on the beach, but we’re eager for a full assessment of the necropsy results as soon as possible. 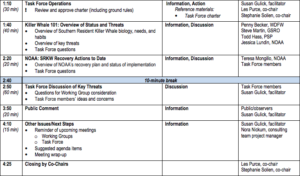 As Canada is currently forming multiple Technical Working Groups to make short- and long-term recommendations for the conservation of endangered SRKWs, now is a good time to learn as much as we can from J34 and ensure that prevention of further “blunt force trauma” to SRKWs is included in the 2019 conservation efforts. 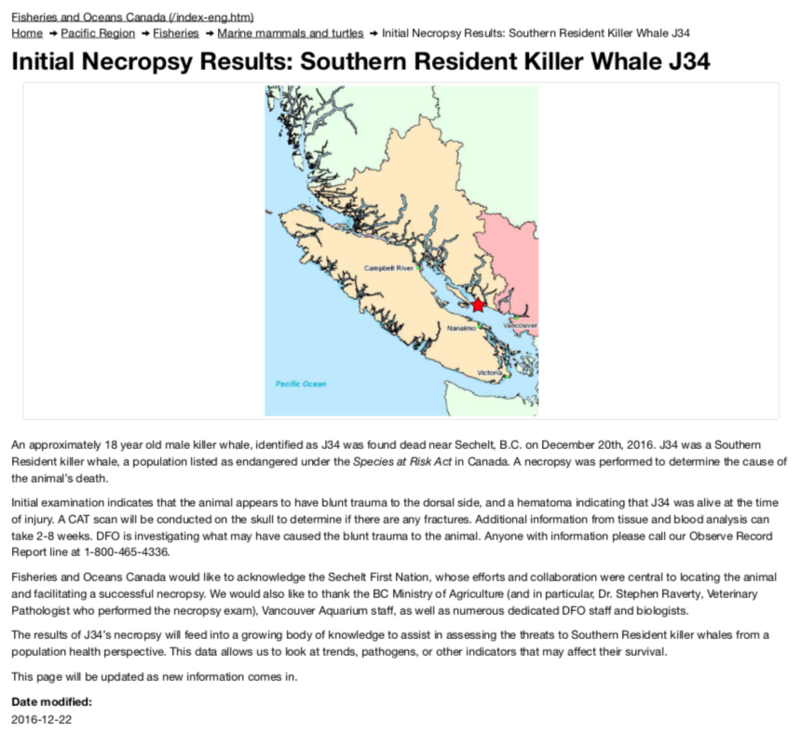 The DFO “Initial Necropsy Results” were available online, both via the DFO web page (via this link; broken in 2018) and the NOAA stranding page (via the same link; broken in 2018). Luckily, we archived it at the time so can provide it here — both as text & a screen shot (both below), as well as a PDF. 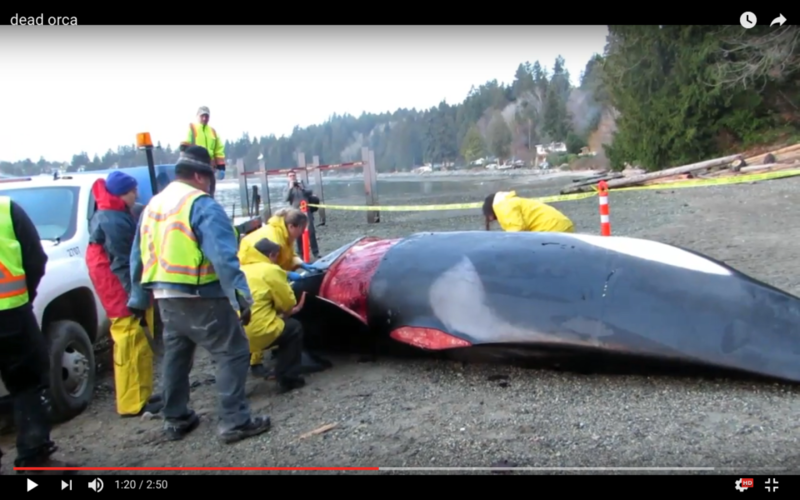 An approximately 18 year old male killer whale, identified as J34 was found dead near Sechelt, B.C. on December 20th, 2016. 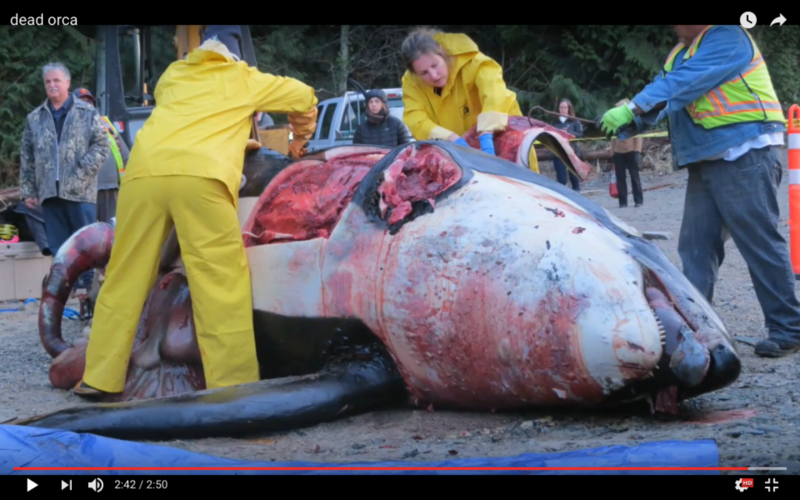 J34 was a Southern Resident killer whale, a population listed as endangered under the Species at Risk Act in Canada. A necropsy was performed to determine the cause of the animal’s death. 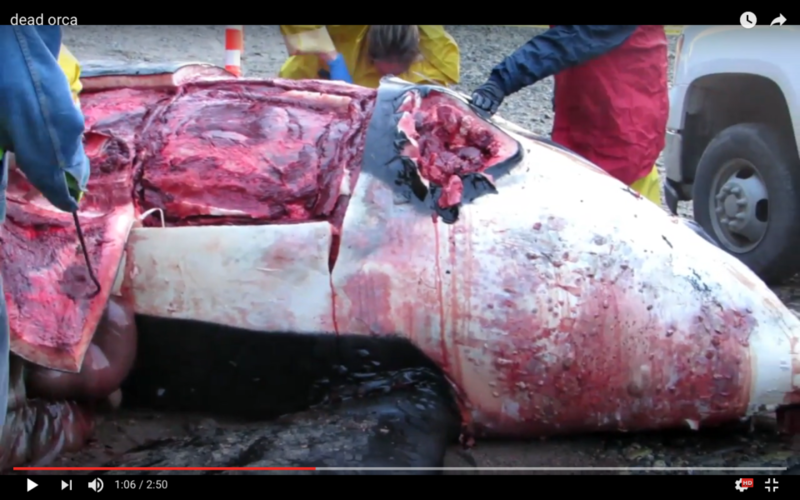 Initial examination indicates that the animal appears to have blunt trauma to the dorsal side, and a hematoma indicating that J34 was alive at the time of injury. A CAT scan will be conducted on the skull to determine if there are any fractures. Additional information from tissue and blood analysis can take 2-8 weeks. DFO is investigating what may have caused the blunt trauma to the animal. Anyone with information please call our Observe Record Report line at 1-800-465-4336. Fisheries and Oceans Canada would like to acknowledge the Sechelt First Nation, whose efforts and collaboration were central to locating the animal and facilitating a successful necropsy. 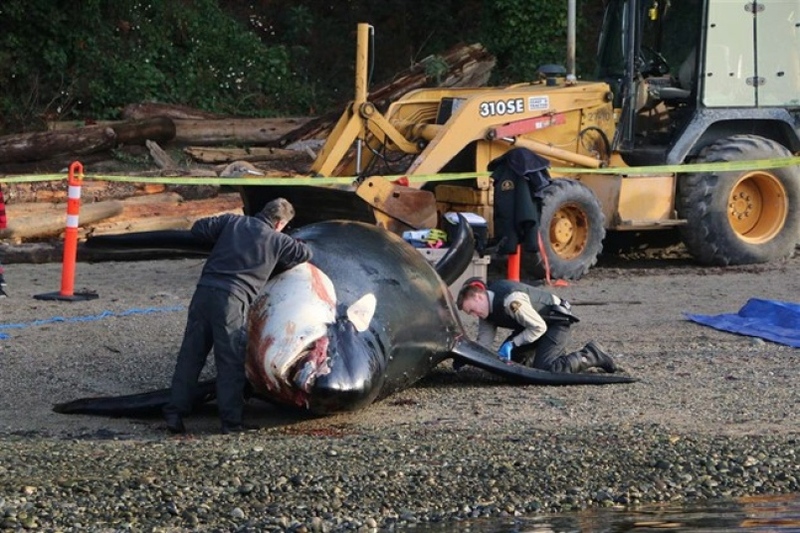 We would also like to thank the BC Ministry of Agriculture (and in particular, Dr. Stephen Raverty, Veterinary Pathologist who performed the necropsy exam), Vancouver Aquarium staff, as well as numerous dedicated DFO staff and biologists. 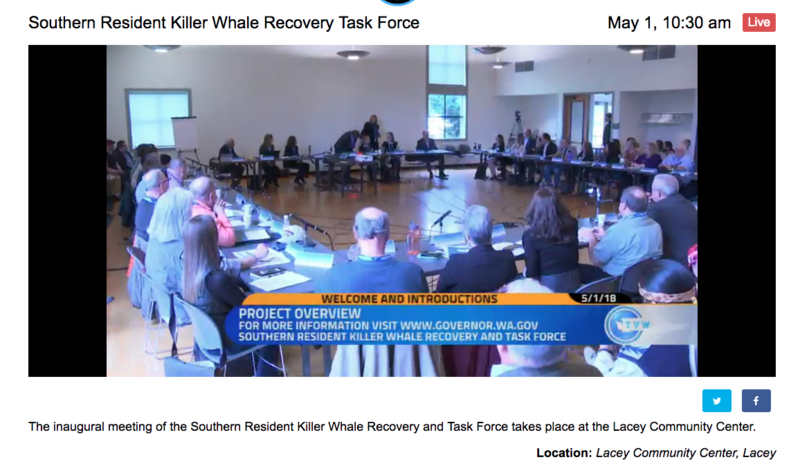 The results of J34’s necropsy will feed into a growing body of knowledge to assist in assessing the threats to Southern Resident killer whales from a population health perspective. This data allows us to look at trends, pathogens, or other indicators that may affect their survival. This page will be updated as new information comes in. Screenshot of the initial necropsy results. 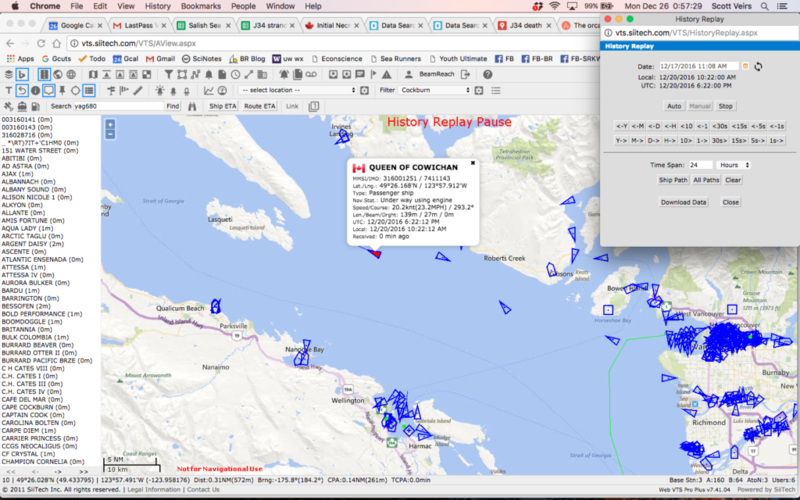 Clicking on the links to the initial report currently resolves to the general Canada-wide DFO home page — both either the relevant DFO web site, or the NOAA West Coast SRKW stranding site (where the link was promptly posted and was functional in December, 2016). 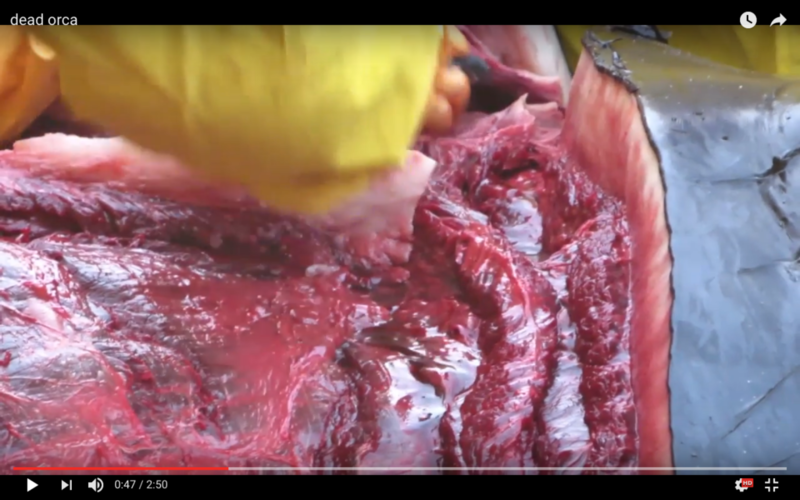 The gross lesions are consistent with blunt force trauma and based on the anatomic site of impact, the sustained injuries would have contributed significantly to the demise of this animal. The tracking hemorrhage throughout the subcutis of the head suggests that the animal would have survived the initial trauma for a period time, prior to death. Although the brain was too autolyzed to assess for hemorrhage (coup contra-coup), a few bone spicules and sheaves up to 3-4 cm long were interspersed within the brain tissue. 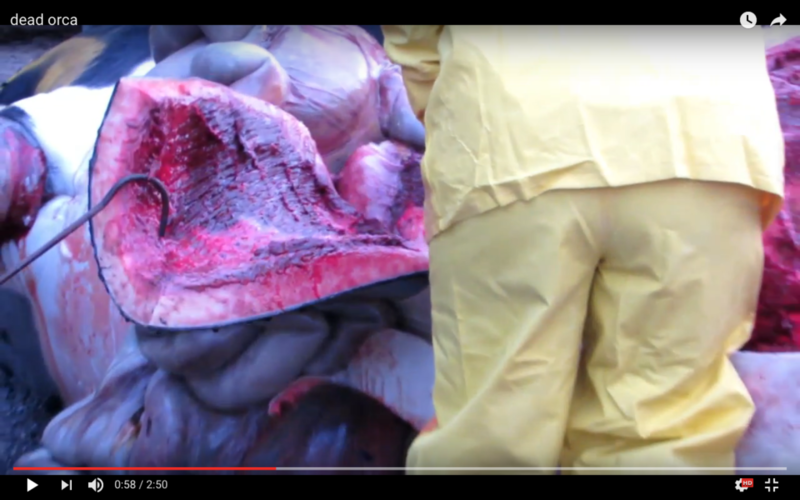 Based on qualitative assessment, the animal was considered in moderate to good body condition and there were no apparent lesions or abnormalities which may have predisposed this animal to injury. 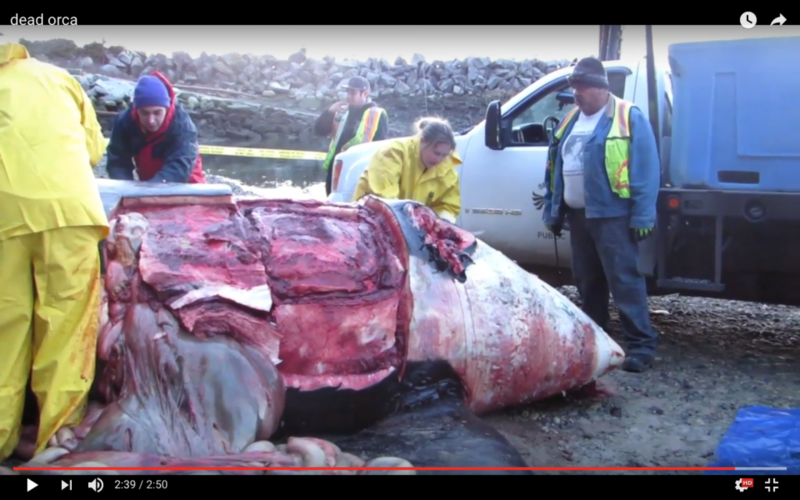 The stranding of J34 was not noted in the 2016 annual report of DFO’s Marine Mammal Response Program (PDF). These images are either screen grabs from videos or photographs put into the public domain. We will try to caption and credit them appropriately in future revisions of this post. Which of the non-acoustic causes could result in evidence that is also consistent with blast trauma, and/or PTS, and/or TTS?! 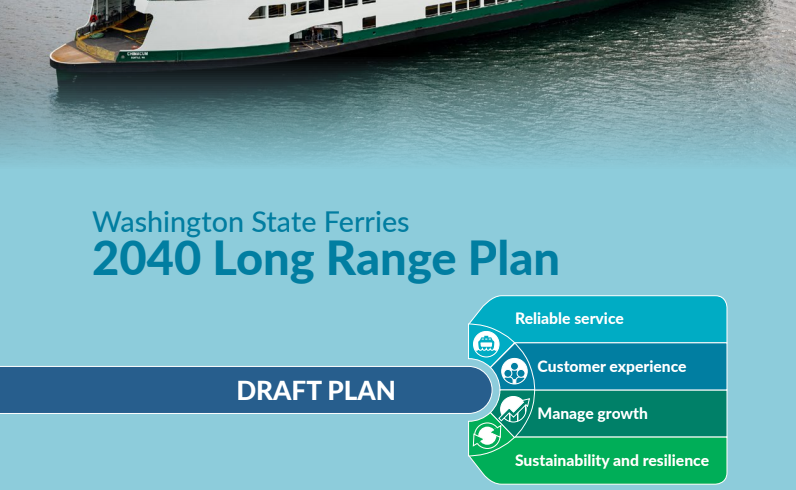 Today was the deadline for public comments on a 208-page draft “long-range” plan for Washington State Ferries (WSF). For the record, here are my comments (as President of Beam Reach) submitted via their web form. Don’t miss the very end; I really like the idea of hybrid ferries beam-reaching across the Sound under mega-kite power during much of the year! “Beyond Executive Orders, WSF should acknowledge that underwater noise from ferries has potential environmental impacts on many marine species (not just the Southern Resident Killer Whales), and state a goal of reducing these impacts even if/after orcas are no longer struggling. 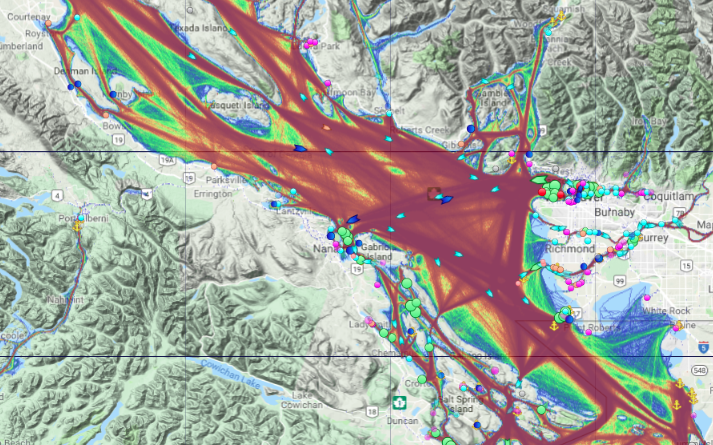 I’d particularly like to see WSF articulate an understanding that its ferries generate noise at a wide range of frequencies — primarily from 1-1000 Hz where baleen whales emit most signals and have maximum auditory sensitivity, but also from 1,000 to at least 40,000 and possibly >100,000 Hz (at close ranges typical within Puget Sound and the San Juan Islands) where toothed whales emit most signals and have maximum auditory sensitivity. This frequency overlap of ferry noise and marine mammal sensitivity and signals means that WSF should be talking and thinking about minimizing acoustic impacts on SRKWs, Bigg’s killer whales, harbor porpoises, Dall’s porpoises, Pacific White-sided dolphin, minke whales, humpback whales, gray whales, Stellar and California sea lions, harbor seals, elephant seals, northern fur seals, as well as soniferous fish of the Salish Sea. Furthermore, the literature suggests potential impacts on invertebrates and even plankton. 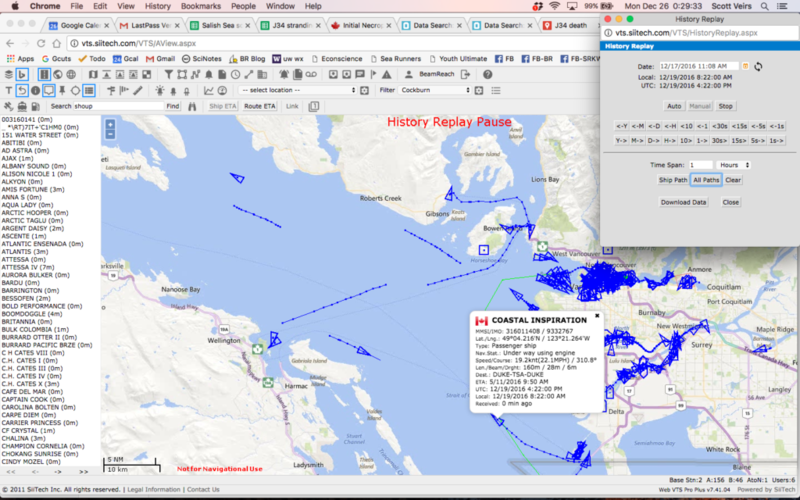 Any design charrette should include consultation with Navy Region Northwest and relevant marine architectural firms with experience in quieting technologies and design/build methods for each ship class (not just ferries). I’m particularly interested in knowing whether there are big reductions in noise from design of unidirectional ferries that use bow thrusters to dock, but have primary propulsion only in one direction (thereby NOT having free-wheeling or reversing propellers at the current bow of the ship — the suspected source of the “clickety-clack” underwater noise signature of WSF ferries). New construction contracts should include noise emission standards that result in lower levels of noise (from 1 Hz -100,000 Hz) from the new vessel relative to noise levels of the vessel being replaced (or in the case of ferries add to the fleet, relative to the median noise spectrum for the fleet). Over time, the WSF fleet noise levels should decrease, ideally to ancient ambient noise levels (e.g. the 5% quantile of 1 minute spectrum levels). Please ensure hybrid or all-electric ferries will be quieter (at all frequencies) than the vessel they replace? There is a danger that demand for faster ferries will result in increased noise levels; though the new vessel is quieter at the replaced vessel’s normal speed, it may be louder when operated at a new, faster speed (e.g. in order to increase reliability or reduce transit times). As the old vessels are replaced, their source spectrum levels should be measured (at least opportunistically, e.g. 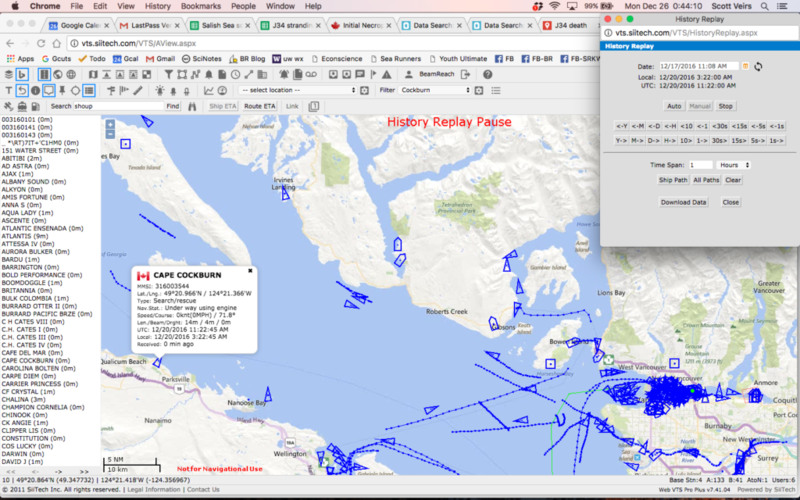 in partnership with the Orcasound hydrophone network, or ideally via an ANSI-compliant methodology similar to the one employed by BC Ferries through a contract with JASCO). 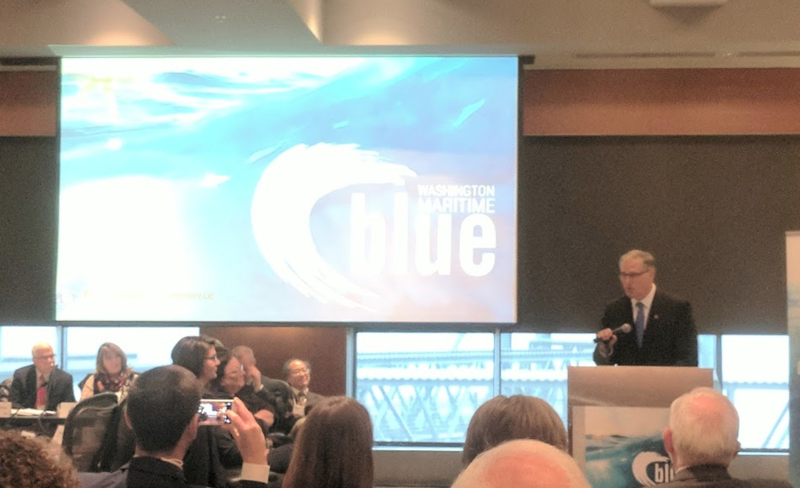 Similarly, new vessels should be measured using the same methodology so that the public can be assured that over the long-term, noise spectrum levels received by local marine species from the WSF fleet decrease to near natural ambient noise levels. If a new vessel under normal operating conditions has higher source levels (at any frequency relevant to local species) then it should NOT be accepted as a replacement! 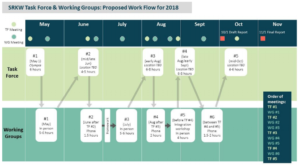 1) Don’t forget that in some cases as ridership grows and more trips are made per day, that on some routes it may be a good long-term investment for the State to fund a tunnel or a bridge! 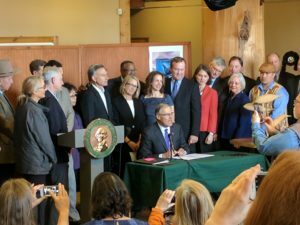 Prior to the signing, the governor spoke about his inspiration — hearing killer whale blows in the fog as a boy — and other regional leaders expressed their support for the order. 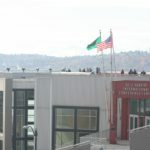 In addition to a Native song from two brothers which echoed majestically through the Daybreak Star Center, speakers included Chairman of the Suquamish Tribe — Leonard Forsman, Vice-Chair of the Puget Sound Partnership (PSP) Leadership Council — Stephanie Solien, and retired President of Evergreen State College — Lee Purce. The latter two, Solien and Purce will co-Chair the new Task Force. See below for video/audio recordings. 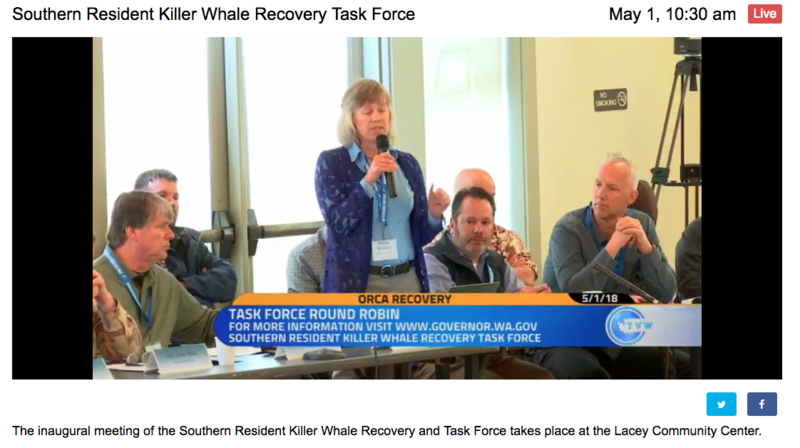 Co-chairs of the new SRKW Task Force. 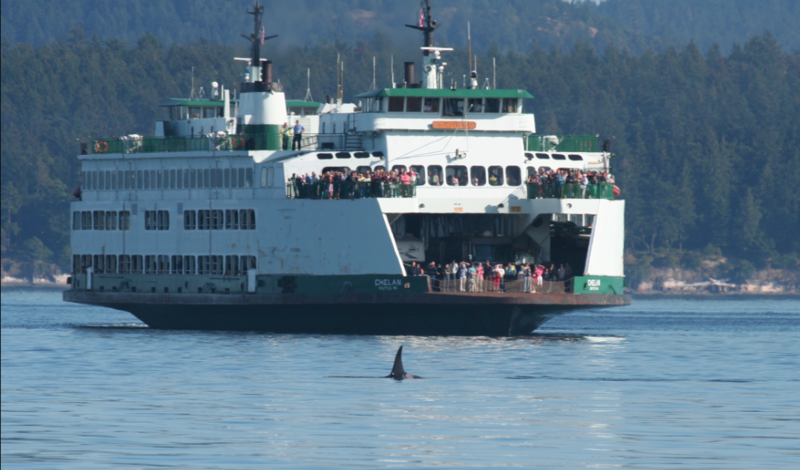 A WSF pauses to let passengers observe an endangered southern resident killer whale. 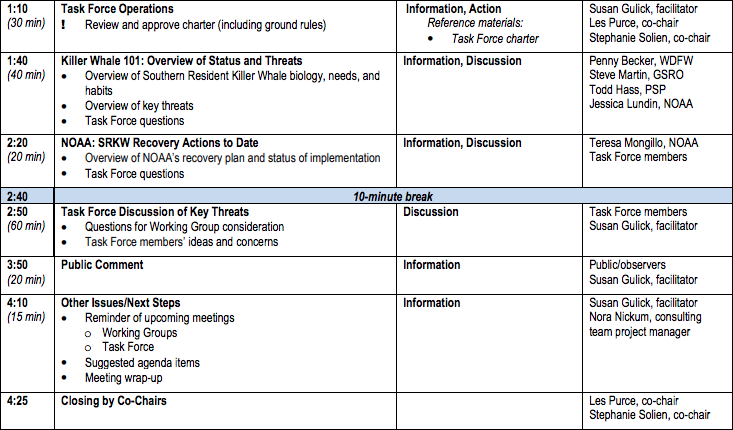 The main goal of the Task Force will be to formulate a longer-term action plan that addresses major threats to the SRKWs. 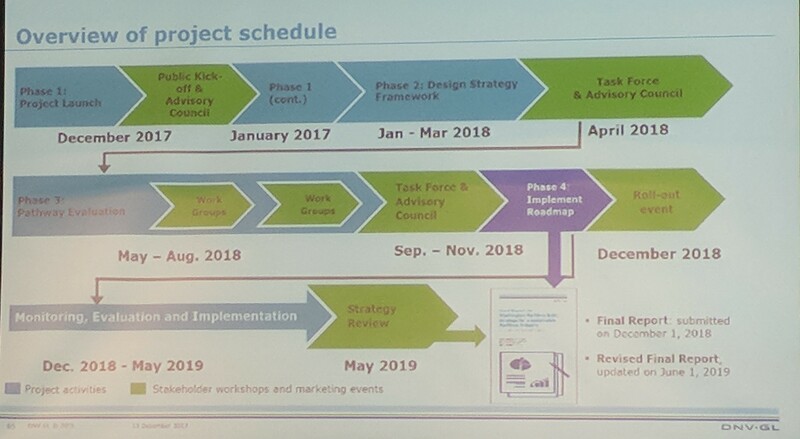 With a broad membership and in collaboration with many other plans and entities (in the U.S. and Canada), the group will first report to the Governor by November 1, 2018. This most-progressive corner of the U.S. may yet save its regional icons, ideally in partnership with the progressive leaders in Canada fueled by their Federal Ocean Protection Plan, but it will likely also take some luck and the proper spirit — keeping in mind our oneness with each other and the orcas, as well as the the long-term prospects for the Salish Sea Ecosystem. On Tuesday December 12, 2017, the Washington Maritime Blue initiative was launched at Bell Harbor conference center in Seattle. Overlooking Elliott Bay on a crisp winter day, the State unveiled the new 21-member Maritime Innovation Advisory Council. 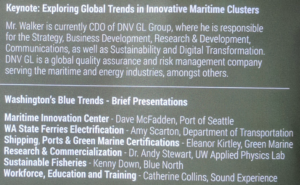 In a nutshell this appears to be an effort by local experts to generate a strategic plan for Washington to have the most sustainable maritime industry in the U.S. by 2050. The time line calls for a strategic report to the Governor within 18 months using a $500,000 grant from the U.S. Dept. 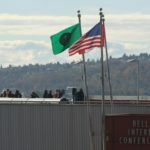 of Commerce (U.S. Economic Development Administration’s Regional Innovation Strategies) and a local match. 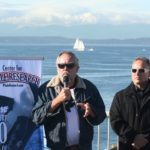 experiencing one of the co-chairs (Frank Foti) ask everyone to spend 60 seconds envisioning the physical beauty of the Salish Sea. 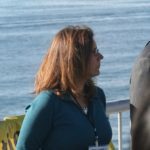 This post presents audio recordings of most of the presentations — from the Governor’s remarks, through a string of speakers beginning with sole staff-member Joshua Berger (Governor’s Maritime Sector Lead), to a facilitated questioning of many of the council members — as well as a selection of images from the room and slide decks. Inslee’s grandfather fished in the San Juans; his son’s have participated in commercial fisheries. 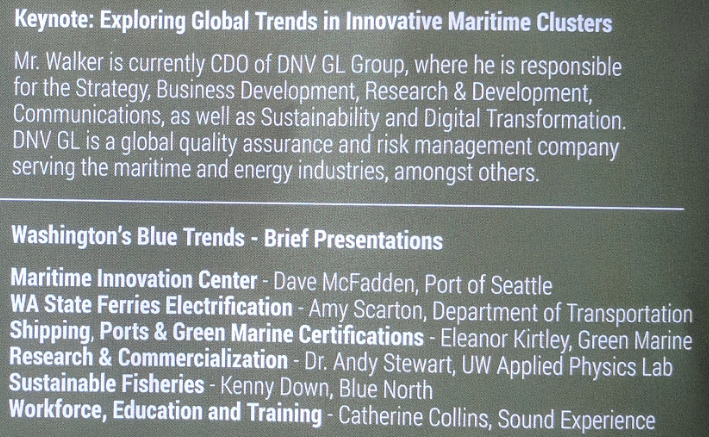 2:00 In 2012 WA State Ferries did a study of conversion to a hybrid propulsion system, but most electric vessels/technologies weren’t available until 2013-15. 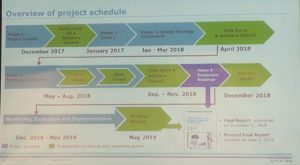 RFP in 2019; engineering in 2020; retrofit in 2021. The spread of the Internet, computing infrastructure, and “ocean observatories” are enabling a new human connection with the oceans and the whales within them. 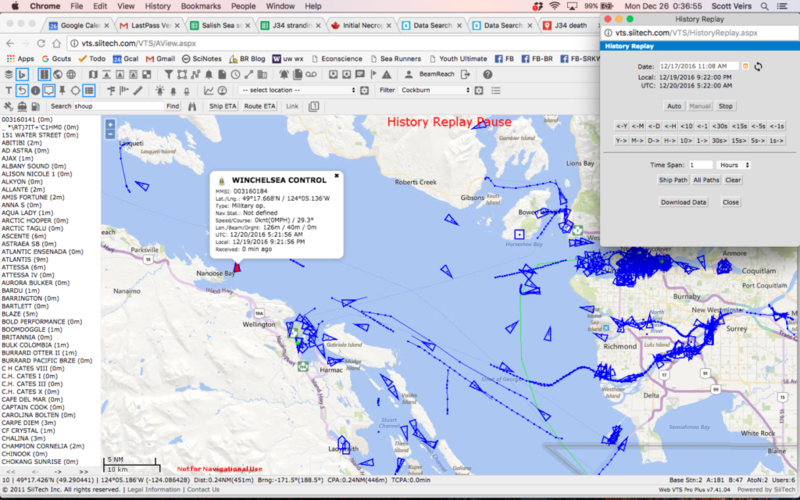 I will briefly review extant hydrophone networks, best practices, and exciting new technologies, and then lead a discussion about the future of the “Salish Sea Hydrophone Network” (SSHP, orcasound.net ) and other hydrophones in the Northeast Pacific. fill in this quick survey about the past and future of the network! Discuss: Know of any others, better dates, or old recordings? 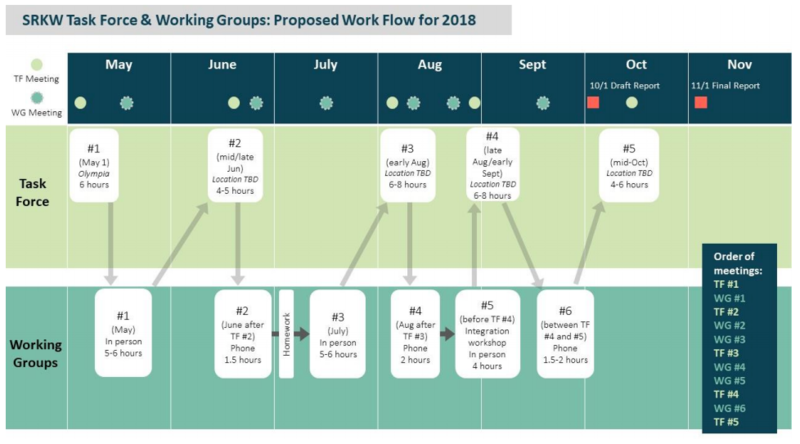 Here’s a rough chronology of listening efforts in the Salish Sea, or at least Puget Sound. Let us know in the comments if you know of others or spy an error! Discuss: What have been highlights for you? Discuss: If you’d tried any of these, what worked well, or didn’t? Know of other links or streams? Let us know in the comments and we’ll add them! Tell us in the comments about your favorite citizen-science experiences, especially if they have to do with whales and/or acoustics! 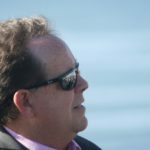 What is your vision for future hydrophone networks? Discuss: What more could be done (for you!) by hydrophone networks (and collaborators)? public access to basic resources and functionality, plus conservation calls-to-action? Mobile deployments (stream or calibrated) via an app? 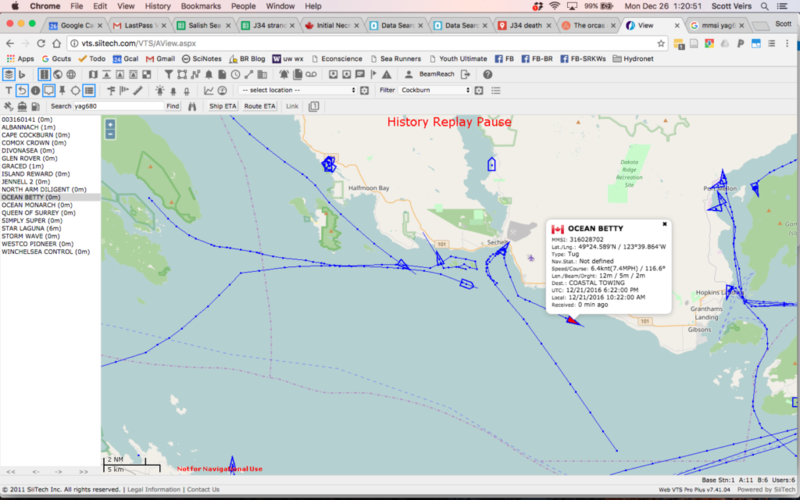 SRKW location data for research responses? 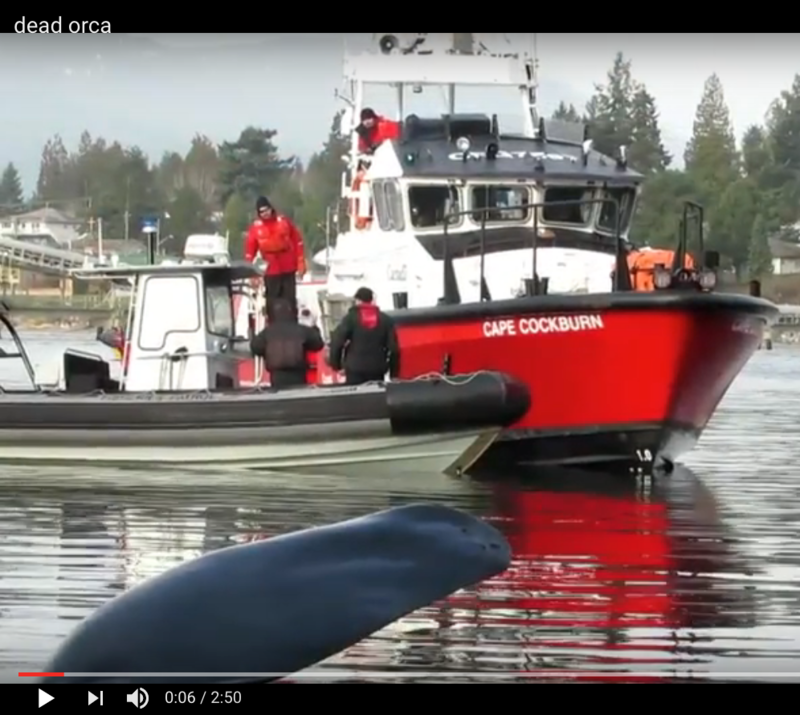 Integration in oil spill prevention and response? 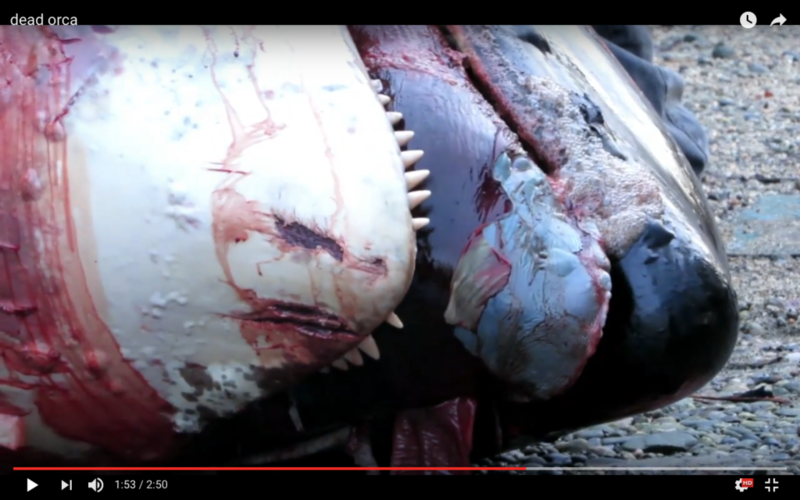 Ken Balcomb the biologist is sick of watching the iconic orcas of the Northwest die, especially mothers and their calves. 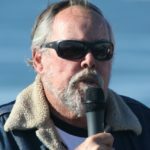 On Friday (10/28/2016) he became Ken Balcomb the activist, asking us all (the public!) 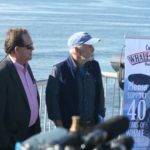 to participate in saving the salmon-eating killer whales he has studied for almost 50 years. 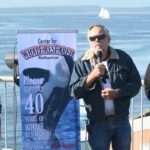 Ken Balcomb of the Center for Whale Research leads a press conference. Sign this old petition/letter to Obama, Murray, Cantwell, etc. 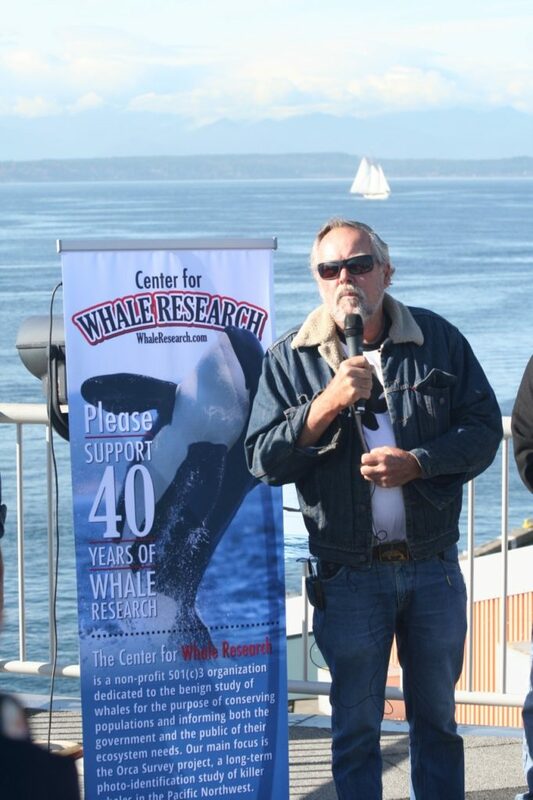 In an unprecedented move, his organization the Center for Whale Research held a press conference today in Seattle. 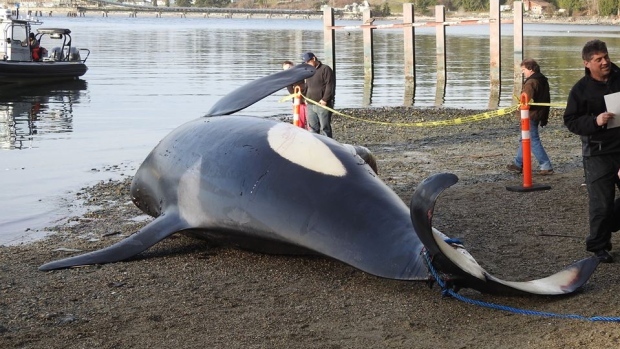 Sadly, the purpose was to announce their conclusion that J-28 (aka Polaris) has gone missing and is now declared dead — a tragic loss of a breeding female (in a population that has declined to 80 individuals this summer) which probably also dooms her youngest calf, J-54 (aka Clipper), who was born in late 2015. 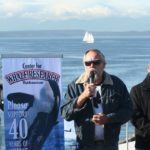 J-54 was part of the “baby boom” of 9 orcas that was heralded as good news in 2015 for the population which is failing to grow at the rate NOAA has specified in the recovery plan for the species. 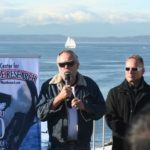 Declaring that he doesn’t like reading the “obituaries” of killer whale mothers and their children, and citing a pre- and post-natal mortality rate of more than 75%, Ken and the other speakers today reiterated the clear need for bolstering the supply of southern resident killer whales’ their favorite food, Chinook salmon. 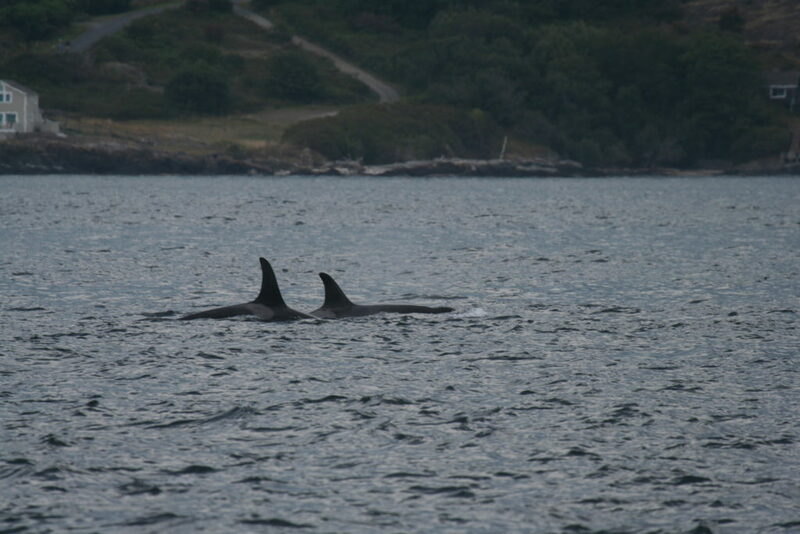 He explained that the failure of fetal and newborn orcas to survive is derived from examination of ovary morphology (which can indicate ovulations, as well as failed and successful pregnancies) in deceased whales and attributed to insufficient food supplies for the mother before and during pregnancy, as well as during lactation. Their call to action was specific — the removal of the lower 4 dams on the Snake river. 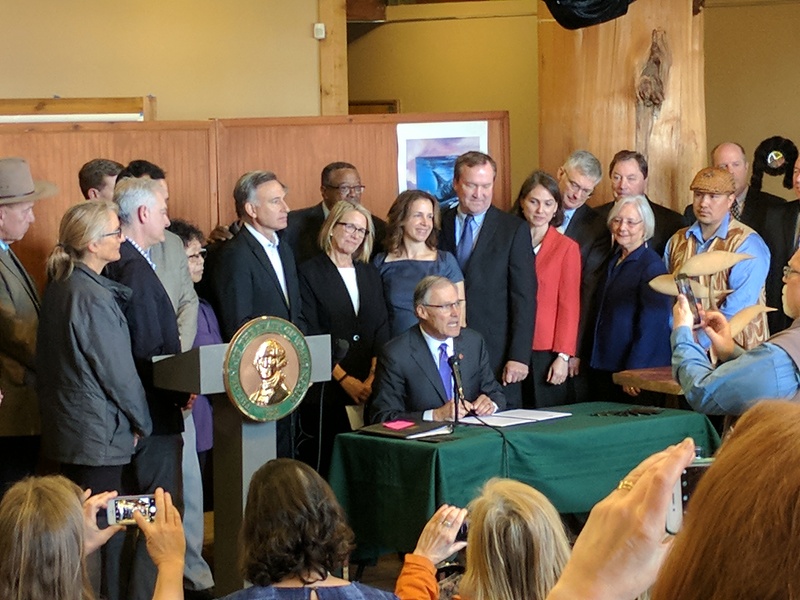 Ken contextualized this with a request that we recover wild salmon populations throughout the range of the southern residents — from California to SE Alaska. 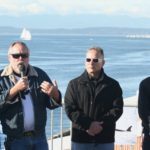 He was joined by Jim Waddel, retired Army Corp of Engineers, who posited that the Corp could begin breaching the earthen portion of the dams as soon as this December (!) — in part because a long history of studies and judge opinions have made it clear that dam removal is the only remaining option that is viable — both economically and ecologically. 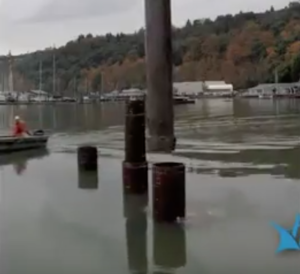 This week PBS News Hour broadcast a segment about underwater noise, and local efforts in the Pacific Northwest to mitigate the noise from pile driving. Driven by the release this month of NOAA’s Ocean Noise Strategy Roadmap, the 7.5-minute segment did a decent job of introducing key ocean noise sources (sonar, seismic, vessels). 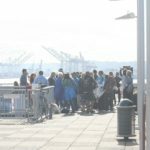 Marla Holt (NOAA/NWFSC) was interviewed and mentioned amplitude compensation of killer whales in boat noise, though the program juxtaposed ships in such a way that the public might be mislead into thinking our +1dB/dB observed compensation in the S1 call amplitude in the presence of boat noise would also be observed in the presence of ship noise. The last part of the interviewer’s efforts went to understanding an emerging mitigation technology: Reinhall piles. She got Per Reinhall, head of the University of Washington Mechanical Engineering Department, to describe a technology he and his grad student helped develop that is being commercialized by a Seattle-based start-up: Marine Construction Technologies. The company’s web-site has some enlightening diagrams that complement Per’s on-screen description which he helpfully facilitated with a black hand-held model. Basically, a Reinhall pile is a standard hollow pile that is driven into the seafloor via a mandrel, or central pile of smaller diameter. 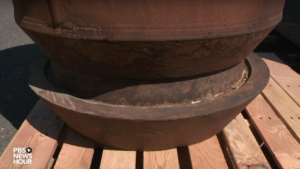 The mandrel is fitted with a proprietary shoe and transmits the pressure pulse from the driver via a “very, very stiff spring” into the base of the (outer) pile. 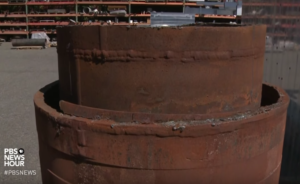 Once in place, the mandrel is removed and can be re-used to drive the next pile. 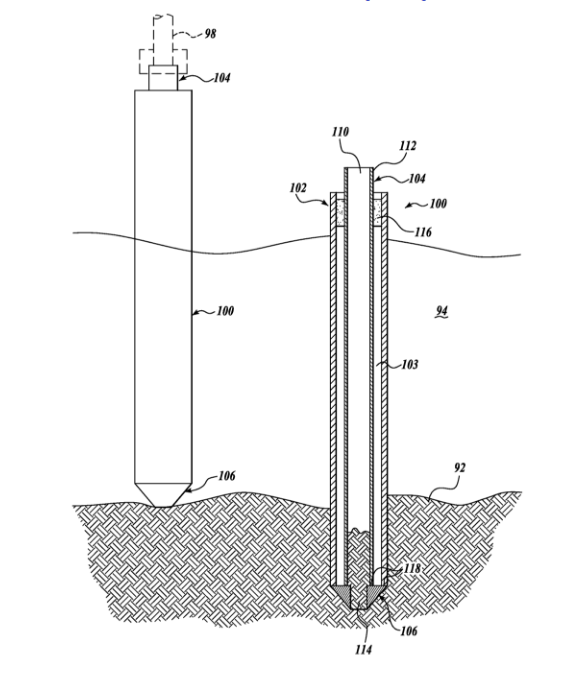 This innovation reduces sound propagation from the pile to the surrounding seawater by creating an air-filled void between the driven mandrel and the outer pile. Since air is compressible (unlike seawater), much less of the energy from the driver’s strike propagates to the seawater because it must travel through the air-filled void as well as the (outer) pile wall. This use of air to absorb some of the pressure pulse from the strike takes advantage of the same physics as bubble curtains — cylindrical clouds of bubbles that rise from rings placed around a pile while it is being driven. The “secret sauce” of the invention, however says Per, is the shoe at the base of the mandrel. It transmits the pressure pulse from the mandrel to the outer pile in a way that reduces the energy transmitted into the seabed. The videos on the company web site provide a few hints into how it works. 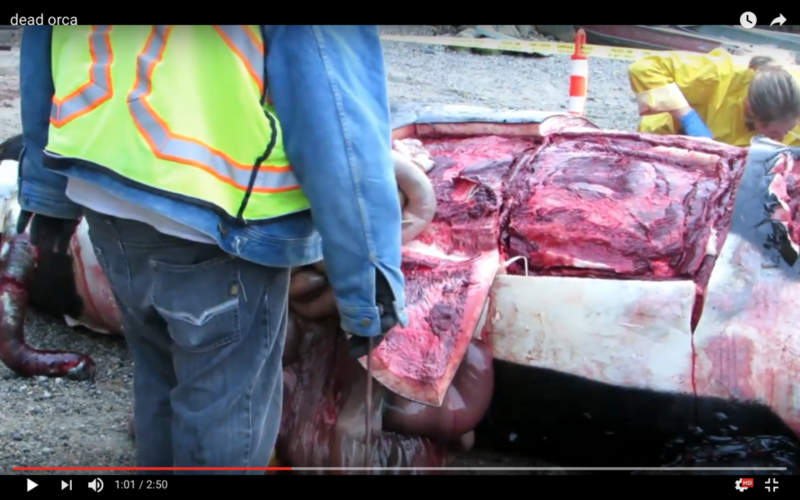 At 10:07 this (silent, time-lapse) video of in-situ tests done in collaboration with the Port of Tacoma and sponsored by the Washington Department of Transportation shows a glimpse of the shoe as the mandrel is removed from the driven pile. Full-scale mandrel being removed from a driven pile. Note the shoe at the base of the mandrel. In this video at 2:37, grad student Tim Dardis provides another perspective on the lower end of the mandrel and the shoe as he creates a sub-scale model. 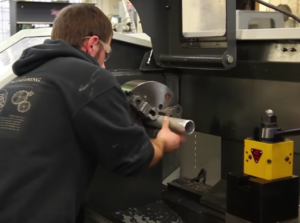 Inserting a sub-scale pile into the lathe. Not sure if this is an outer pile, or an inner pile that is welded to the shoe to create the mandrel. Based on the diameter, I’m guessing inner. The mystery in the exciting story is “where’s the spring?” Per says it is a “flexible coupling” at the bottom of the mandel. 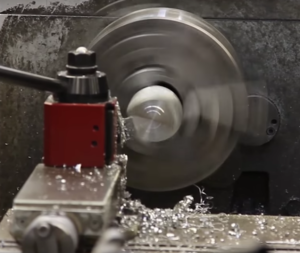 In the lathe video, Tim mentions that the shoe is welded on to the inner pile. 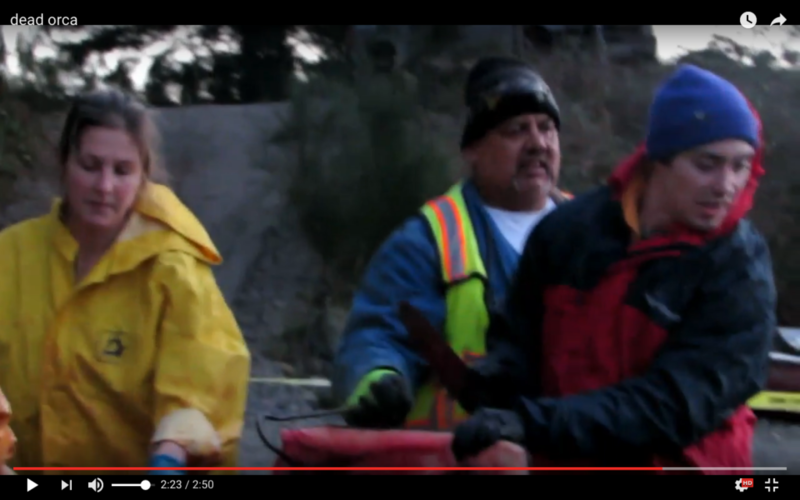 The PBS footage includes short clips of a couple piles on the (Tacoma testing?) dock, as well as a prototype that represents the best public estimate of how the coupling, or shoe, is engineered. Full-scale piles on the dock. Is the left one the inner pile (mandrel) and the right a standard pile? Base of a prototype of the Reinhall pile. Where’s the spring? Top of a prototype of the Reinhall pile. It’s not clear to me where the spring is in this invention. But the physics of springs does suggest that the basic idea is a good one (at least for nearby fish, but maybe not for actually overcoming the resistance of seafloor sediments to an inserted vertical pipe). When a rod-spring system is hit on the top of the rod by an instantaneous force, what happens? The impact on the end of the rod generates a compression wave that propagates down the rod and eventually compresses the spring a distance which is proportional to a spring constant. Along the way, energy is transmitted to the adjacent air and through the spring to the sediment. So, how exactly is it put together? 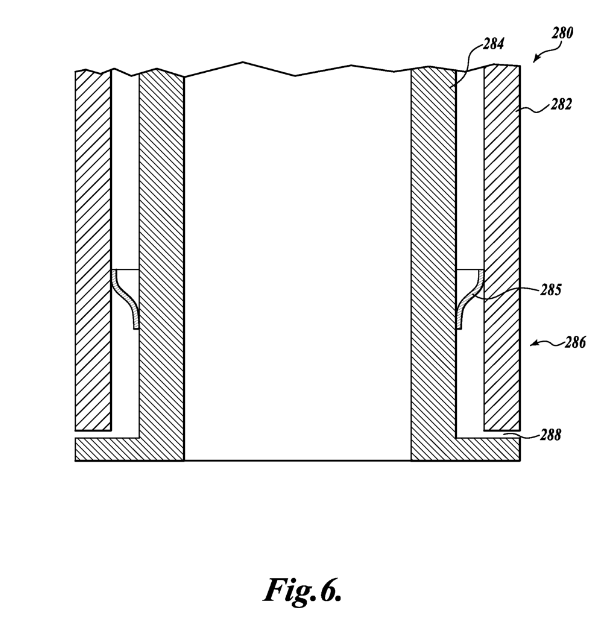 The patent for “Pile to minimize noise transmission and method of pile driving” provide some answers. First, it suggests that there may be some compliant material used between the inner and outer piles to keep them aligned — at least near the top, and possibly throughout the air-filled void (especially if there are leaks and it fills with water!). Overview diagram from the schematic. Compliant material (116) helps pile alignment at the top. The driving shoe (106) at the bottom has: an outer diameter equal to or greater than the outer pile’s outer diameter; and, a central aperture (114) to admit sediment with a diameter slightly below the inner diameter of the inner pile. Still no springs! And now the outer pile is welded up so as to “capture” the inner pile. I thought the inner pile was going to be re-usable, but now its flange is stuck inside the recess of the outer pile! We have, however, got some interesting gaps (260 and 262) separating the inner and outer piles… Are we trying to keep water from leaking in? Maybe, but I don’t get why it’s better acoustically to pull the outer pile down via a flange rather than the aforementioned shoe. Maybe the compressional wave transmits less energy to the sediment if it is partially reflected by the flange/recess interface?! To me it doesn’t seem worth losing the re-use of the mandrel. Of course this drawing is a little confusing. How are you going to get the inner pile out? It seems this also is a non-reusable mandrel “embodiment” of the design. And what is 288? Mysteriously, it’s not defined in the patent! No matter how exactly it works mechanically, the invention is effective acoustically. Overall, the underwater noise is reduced about 20 dB lower (peak-to-peak, or RMS) with the Reinhall pile compared to received levels from a standard pile. 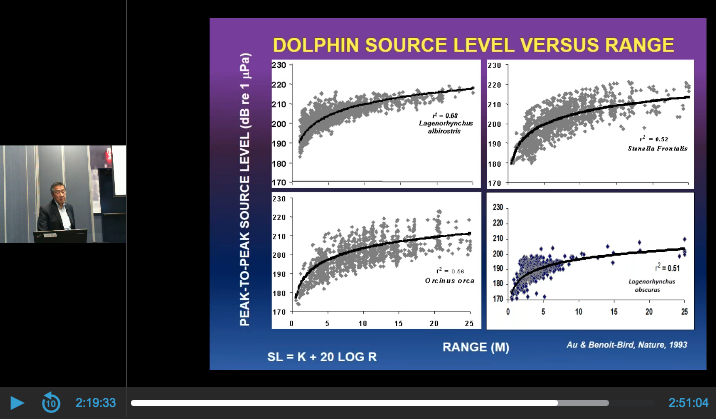 Per explains in the PBS piece that this is equivalent to a 90% reduction in volume (pressure amplitude). A 20 dB reduction also means the noise is 100 times less intense. 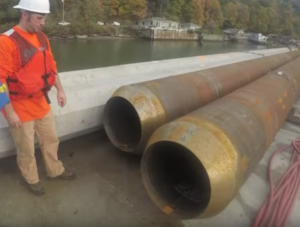 Accolades to the UW and Marine Construction Technology for providing the public with a nice audio clip allowing comparison of the received sound from the control and the Reinhall pile. Have a listen! 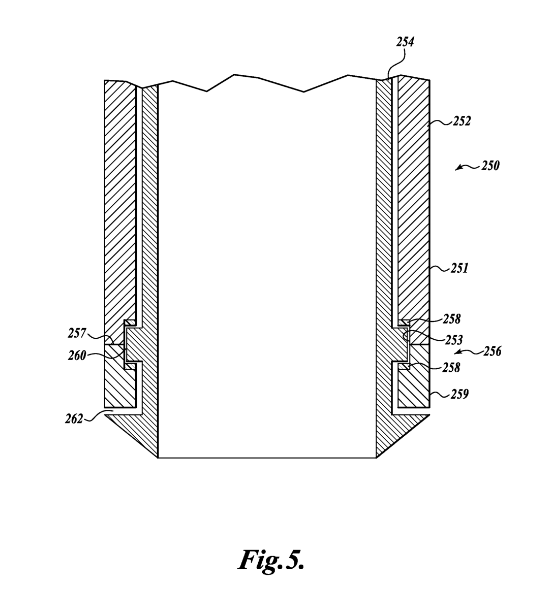 I’m left wondering who reviews and approves these pretty nebulous patents. 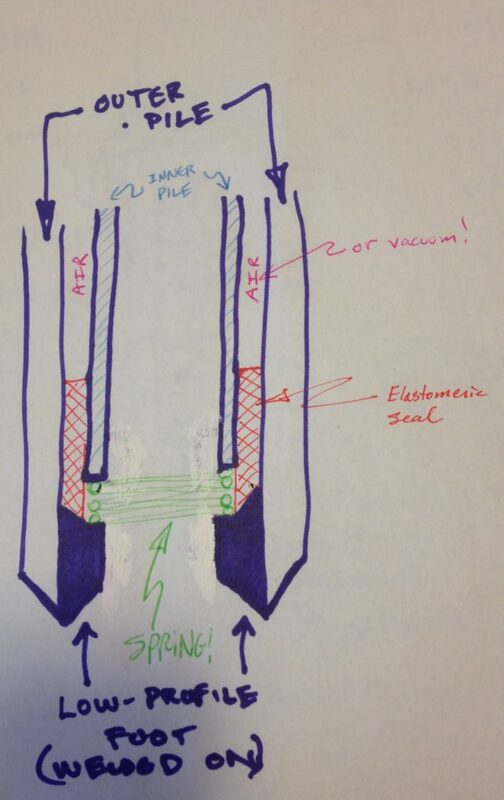 It seems the design challenge is to optimize acoustic mitigation with efficient installation of the pile — and ideally a pretty standard pile (to save costs and installation steps). The real innovation of Per and Peter is that they found a way to extend that cylinder of sound-absorbing air down into the sea — not only to the seafloor to block propagation directly in the water (per their ASA talk “Attenuation of pile driving noise using a double walled sound shield”), but also within the seafloor, thereby reducing transmission from the walls of the inner pile to the sediment. Some of their thought process is captured in this article. seals the connection between the inner and outer pile (to ensure water does not displace the air) with an elastomeric material (red) that has a beveled lower edge that weds to the shoe’s bevel.